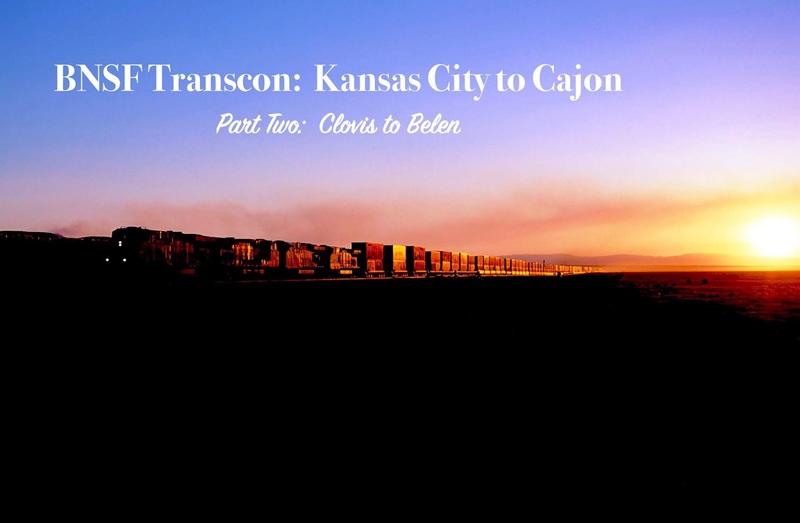 In this series, we are following BNSF's Transcon from Union Station in Kansas City, Missouri, to the mouth of Cajon Canyon in San Bernardino County, California. 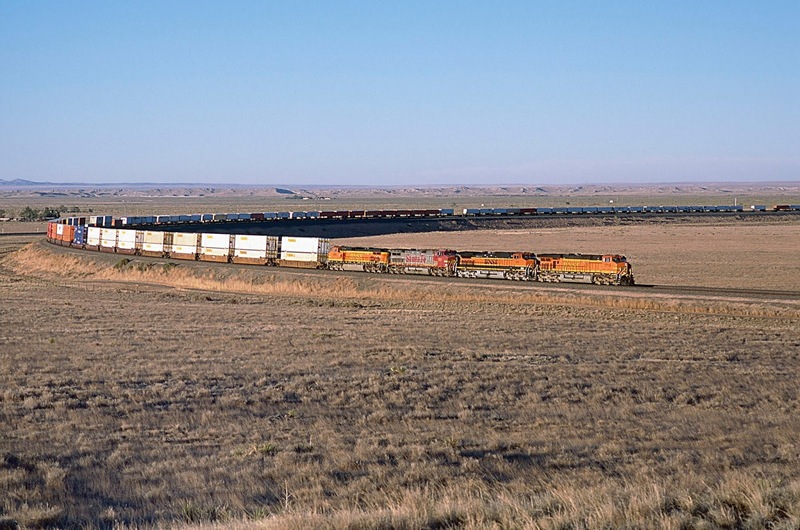 Part One covered the line from Union Station through the Llano Estacado in the Texas Panhandle. Part Two runs from Clovis, New Mexico, on the eastern border of the state, to Belen, hard on the banks of the Rio Grande. As in Part One, the photographs are numbered to correspond to their numeric locations on the inserted maps. New Mexico is perhaps the most fascinating state in the Union. It contains the oldest state capital (Santa Fe) and the oldest Pueblo cultures in North America -- Zuni, Laguna and Jemez are just three of many. 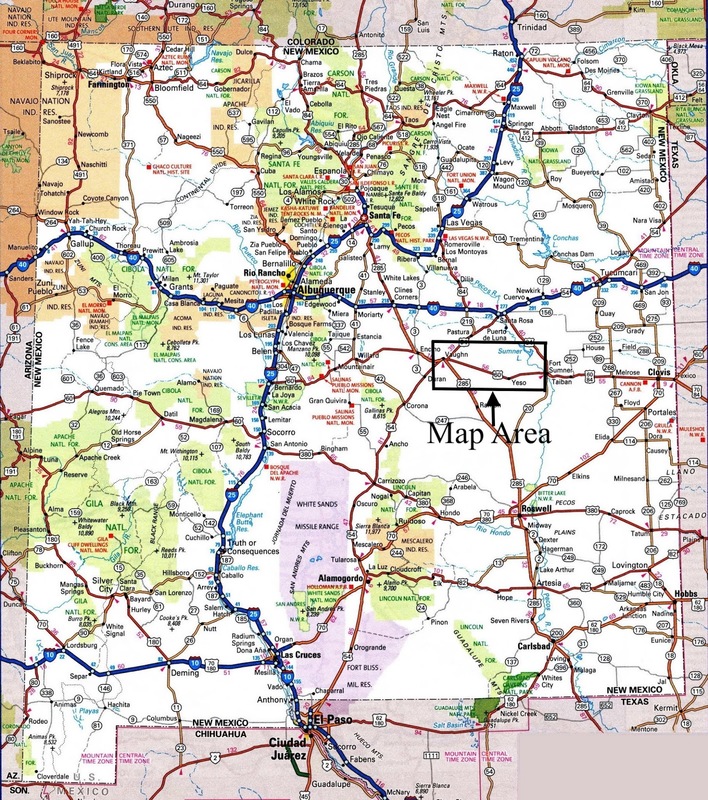 New Mexico is pock-marked with hundreds of volcanoes (many extinct, though not all), the southern end of the Rocky Mountains, mile upon mile of ancient lava fields and a huge escarpment upon which the first atomic bomb (fission) was created (at Los Alamos). These are heavily detailed and contain many more images than you will find in this post. Here we are surveying the Transcon across the eastern half of New Mexico; thus, a certain level of detail must be sacrificed. But none of the high points are missed. In addition, you may find some locations that you were previously unaware of. I hope you find the journey enjoyable. 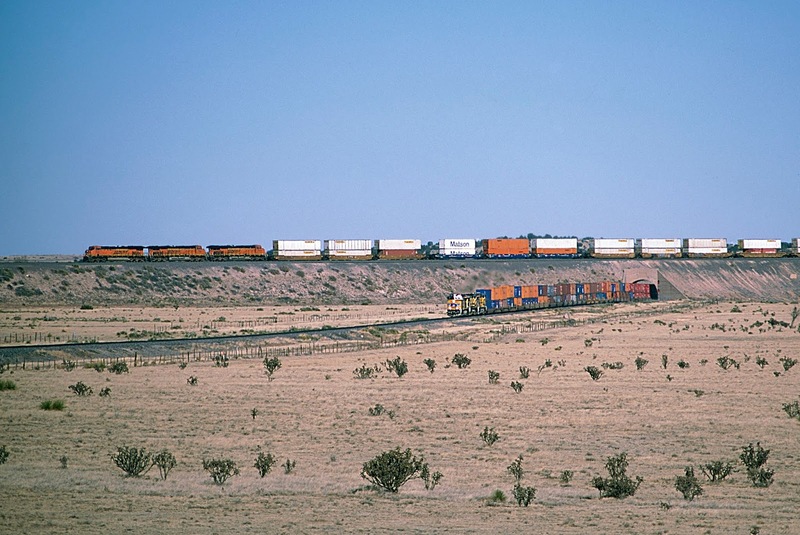 As the Transcon winds west, it comes to the small town of Clovis, which despite its size contains a major railroad yard -- for Clovis is where the BNSF line to Texas and ultimately Houston ties into the railroad's western highway to the Pacific. Clovis sits on the edge of Llano Estacado (see Part One for a description of this unique geographic formation) and is little different than other towns of the region -- flat, dry, dusty and friendly. Average annual rainfall is about 18.5 inches, much of which falls in downpours that run off into the surrounding streams that are otherwise dry throughout the year. In this country, water is as precious as eyesight. 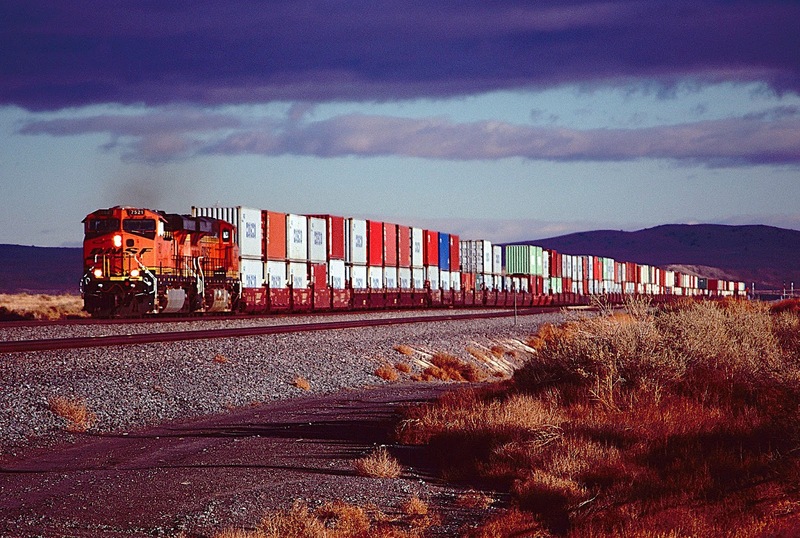 Photograph #1: Westbound stacks have just left the yard in Clovis. Behind them, a late afternoon thunderstorm is racing eastward, away from the setting sun. 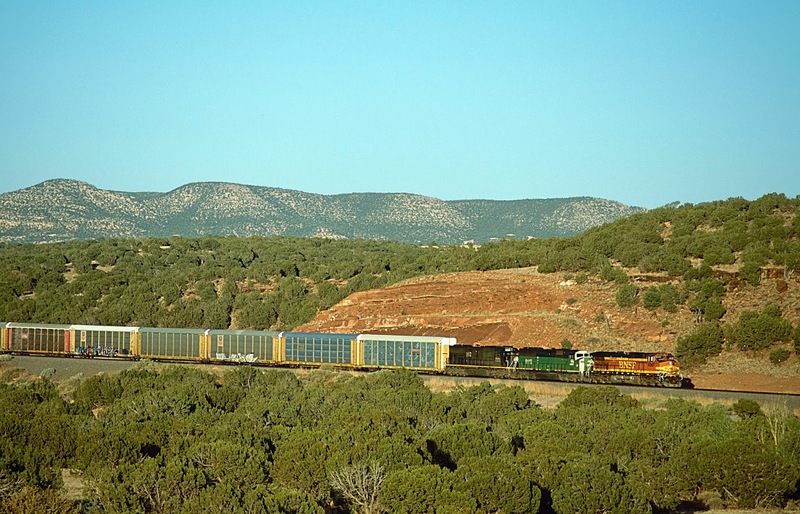 In about fifteen miles, the train will leave the Llano Estacado and begin a long, slow descent into the valley of the Pecos River. Photograph #2. 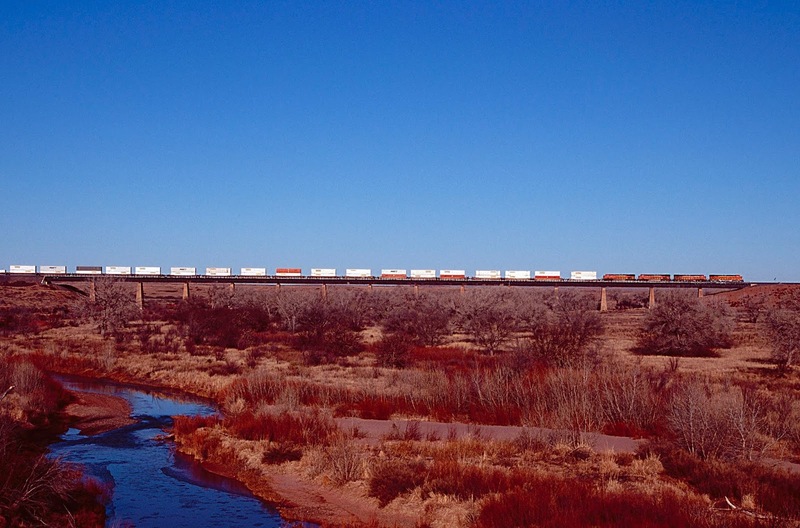 Eastbound stacks are climbing the grade out of the Pecos River valley toward the Llano Estacado. 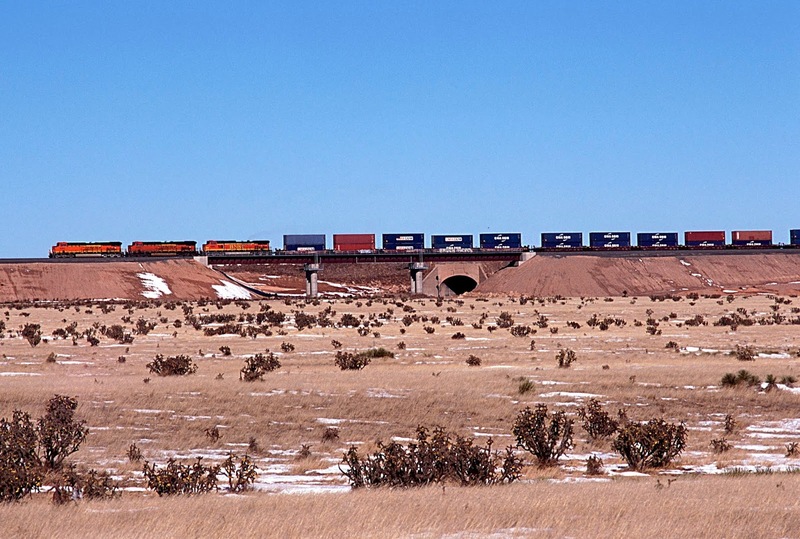 Photograph #3: A westbound manifest approaches the US Highway 60 overpass east of Fort Sumner, New Mexico. Photograph #4: An eastbound bare-table is racing across the valley of the Pecos River. The Pecos River's source is on the eastern slope of the Sangre de Cristo Mountains, about 45 miles northeast (as the crow flies) from Santa Fe, New Mexico. 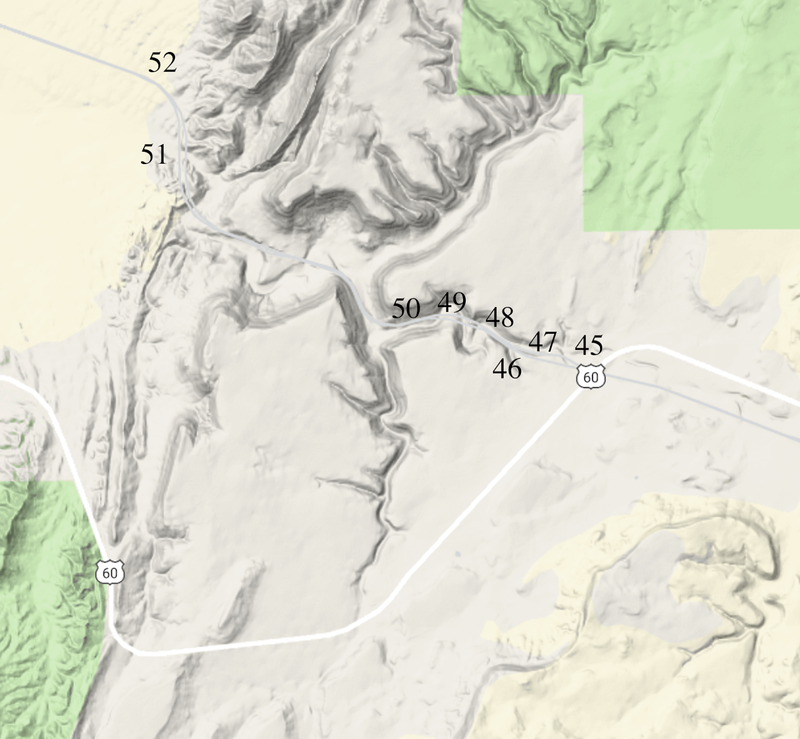 Several authorities credit Pecos Falls as the source, but if you follow the river on satellite photographs (such as Google Maps) you will note that the river appears to originate at a natural pond about two and one-half miles north of the falls. The Google Map coordinates of the pond are: 35.973808, -105.558968. 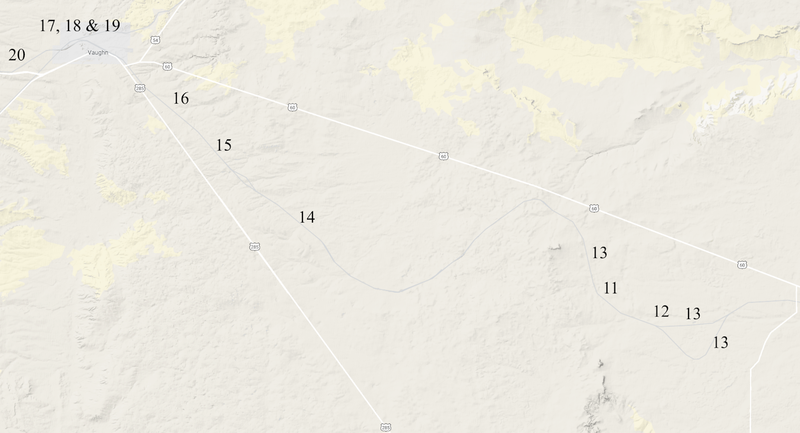 Upstream from where the Transcon crosses, the Pecos is twice dammed to create reservoirs: Santa Rosa Lake and Fort Sumner Lake, both of which significantly decrease the river's flow downstream. In dry months when the dams are closed (most of the year), the Pecos is barely a trickle where it is crossed by the Transcon. 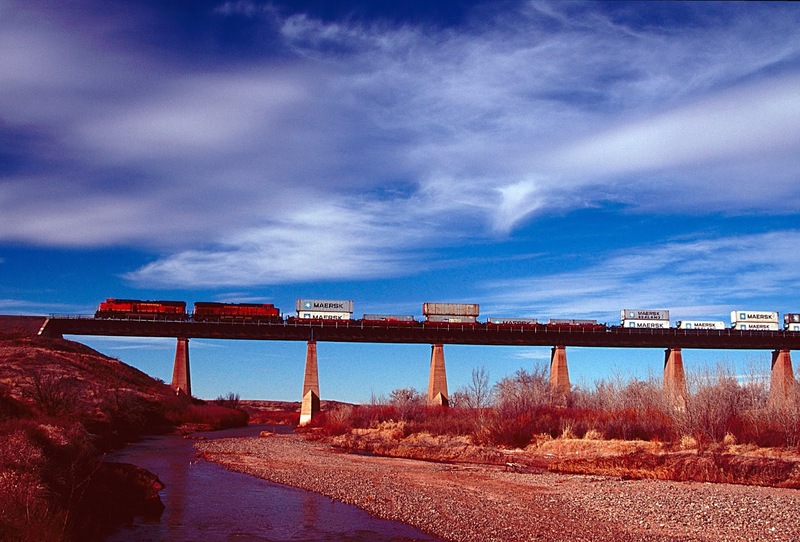 Photograph #5: BNSF's Transcon crosses the Pecos River at Fort Sumner, New Mexico. This image was taken from the abandoned portion of US Highway 60, which was rerouted upon completion of a new highway bridge. One can park on the abandoned black-top without fear of the passing traffic, 65 yards or so away, and photograph trains all morning during winter (when the sun is behind the photographer). Photograph #6: Pushers on eastbound stacks are crossing the Pecos River, which at this location on this particular day was about ten yards wide and perhaps two inches deep. This image was taken in January, and I am not athletic enough to broad jump 30 feet (with or without camera equipment), so I had to walk through the water in my Gortex-lined boots, which kept my feet dry but not warm. 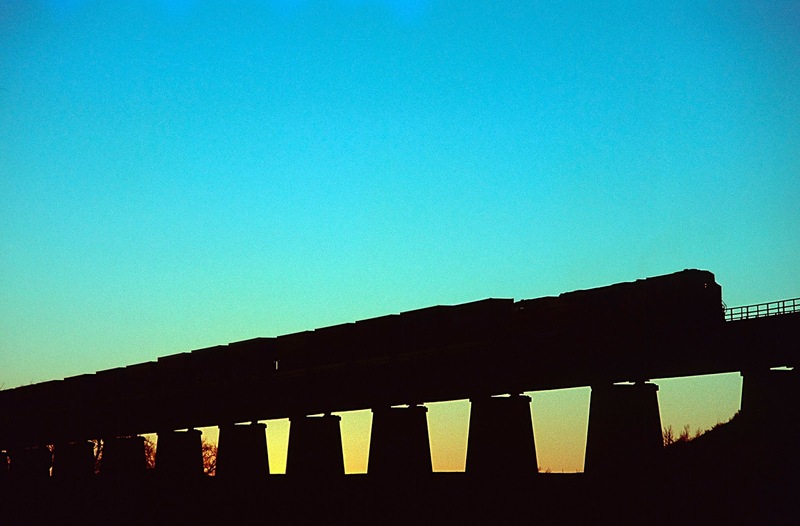 Photograph 7: Pushers on the Pecos River bridge at sunset. From the east, the Transcon's decent into the valley of the Pecos River is gradual. 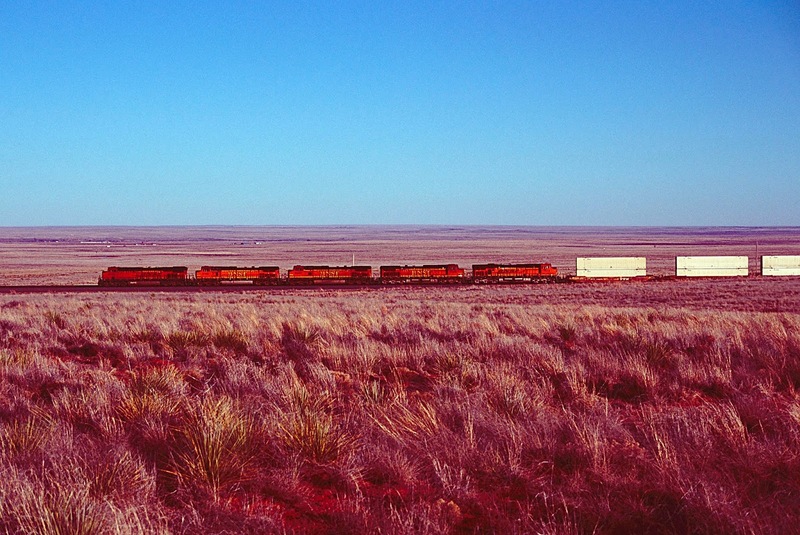 To the west, however, the hills rise abruptly out of Fort Sumner, requiring the railroad to meet the grade by running southwest, much as a sailboat tacks sideways into the wind. The grade is steep, but not overpowering. About five miles after crossing the river, the tracks turn sharply northwest, tacking again up the grade, which is surmounted in another couple of miles. The Transcon in this region is isolated, but can be reached with a high-clearance vehicle. Four-wheel drive is recommended. 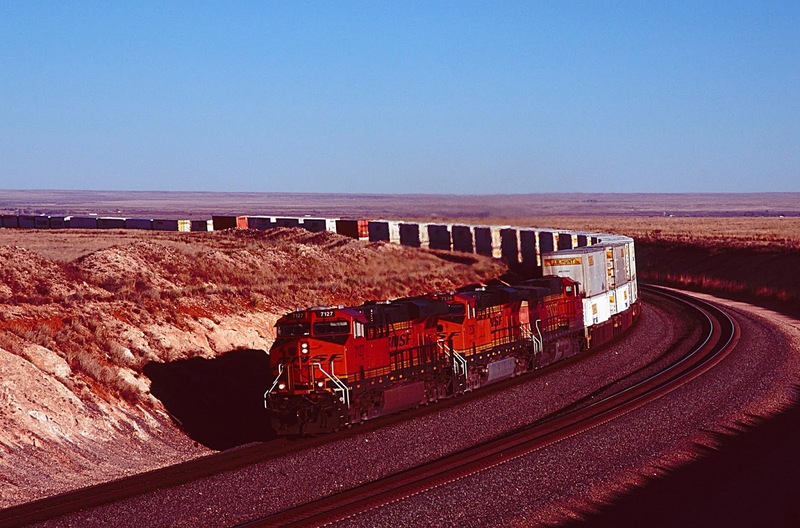 Photograph 8: Eastbound stacks on the grade toward Fort Sumner. 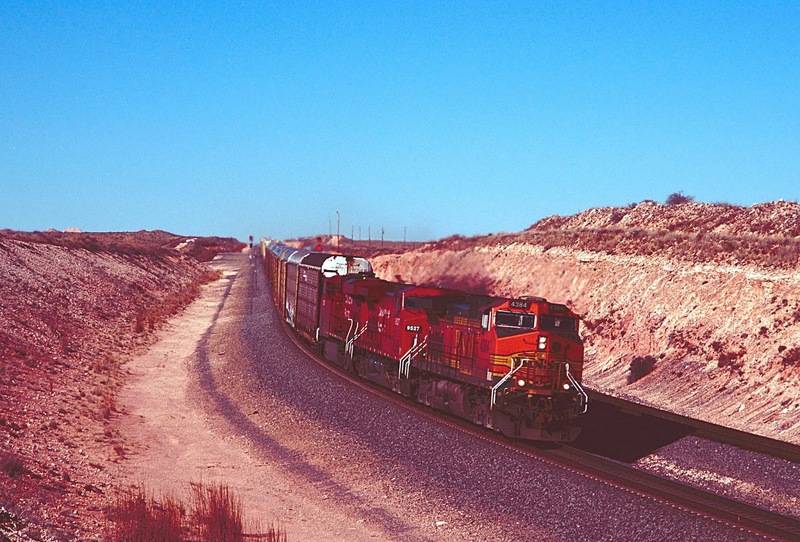 Photograph 9: A westbound is making the big turn on the hill southwest of Fort Sumner. Photograph 10: Eastbound autos are racing downgrade, beginning the turn southeast toward the Pecos River and Fort Sumner. In the background is the top of the grade out of the river valley. 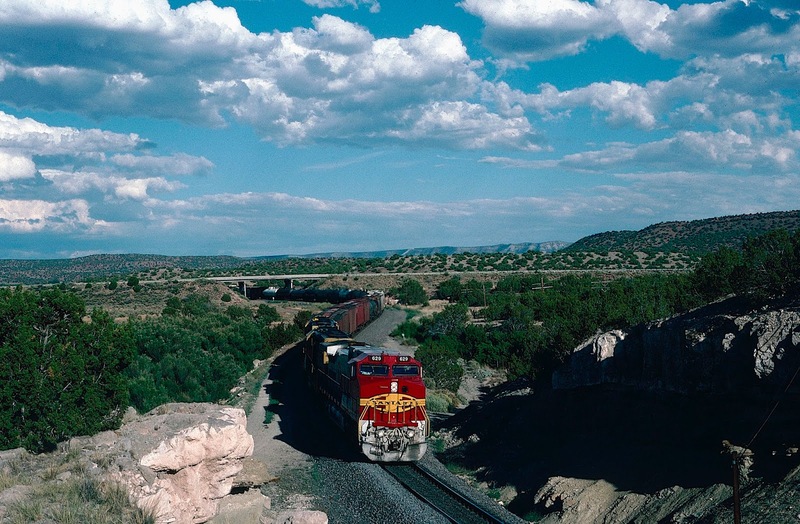 Once the Transcon ascends west out of the valley of the Pecos River, trains cross the high country of east central New Mexico. The land here is not flat, and its breadth is awe-inspiring. Remnants of ancient volcanoes are scattered here and there like bread crumbs, and the nearest tree is far to the east. The tallest plant for a hundred miles is the Tree Cholla, a cactus which in this country rarely grows over three feet. Because of severe slopes, the tracks wind significantly south of US Highway 60, the main route through this portion of the world, before re-joining the highway for a short distance at Yeso. 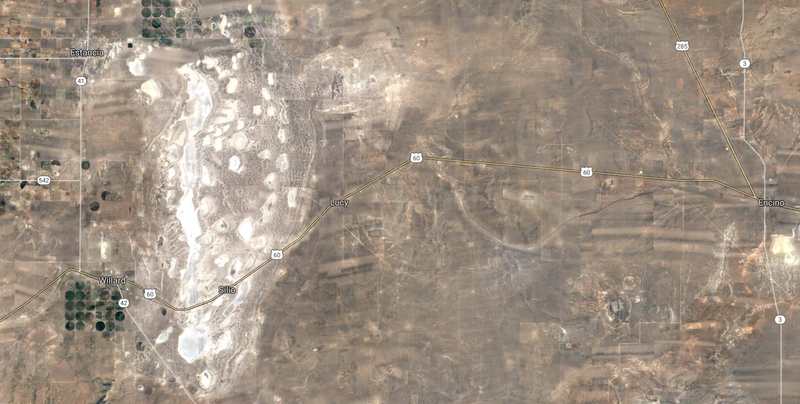 Then the tracks swing hard to the south again, splitting in an area unapproachable by any road. The original single-track line climbed a steep westbound grade here, so when the line was double-tracked in the 1990's, the new track took a circuitous route up the hill to lessen the grade. The new alignment is clearly visible on maps and satellite photographs, but for years I despaired of ever taking images of the split tracks because of their inaccessibility. On one trip in the summer with Bear the Mighty Dog, on a whim I decided to drive my Jeep off the main highway onto what looked like a goat trail. All the dirt roads in the area were gated, but this one was open, so in I drove. In about a mile, I saw the beginning of a hill in the distance. As I drove closer, the hill grew, and I soon recognized that I was viewing a small mesa running due east and west about a hundred yards, probably no more than 30 yards or so wide from north to south, and perhaps a hundred feet taller than the surrounding plains. To my amazement, another trail led up the side of the hill, and I was prepared to take it, when a pick-up came along in the opposite direction, carrying three ranch hands. We stopped and chatted for a moment. Their faces were the color of the red soil in that country and about as worn as the old tires on my Jeep. I asked if I could drive to the top of the mesa to take photographs of the railroad. They told me that the name of the mesa was Loma Alta, and that I was welcome to drive to the top and stay as long as I wished, provided I did not disturb the cattle. The drive to the top was exhilarating, because the trail disappeared about half-way up, and the remainder of the ride was over dirt, rocks, cacti and God knows what else. We bounced left, right, up, down, backwards, forwards, and Mighty Dog looked at me as though I'd lost my mind, which I believe I had. Somehow or other we reached the top, mostly because of blind luck and Jeep engineering, and there we stayed for the remainder of the afternoon. I have to say that Loma Alta has turned out to be one of my all-time favorite railfan spots. I think it might be yours, too, if you can make it to the top. Photograph 11: This image was taken from the base of Loma Alta. 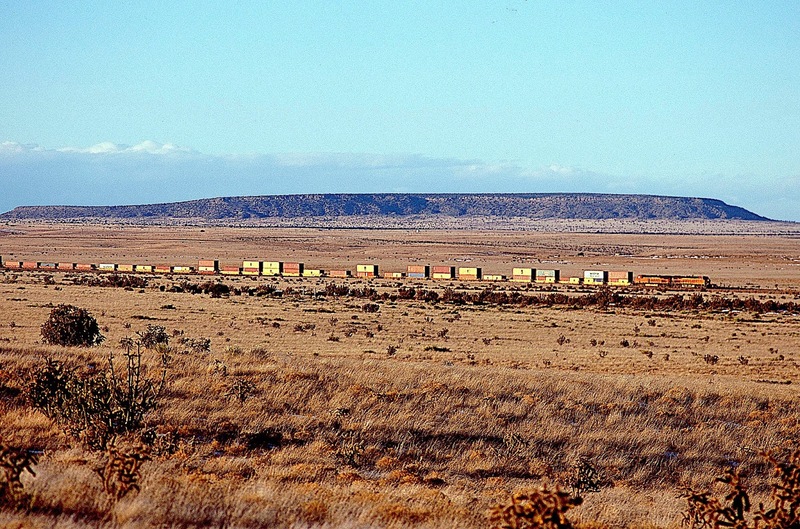 Westbound stacks are crossing the high semi-arid plains of eastern New Mexico. In the foreground are the ubiquitous Tree Cholla cacti that grow here like weeds. 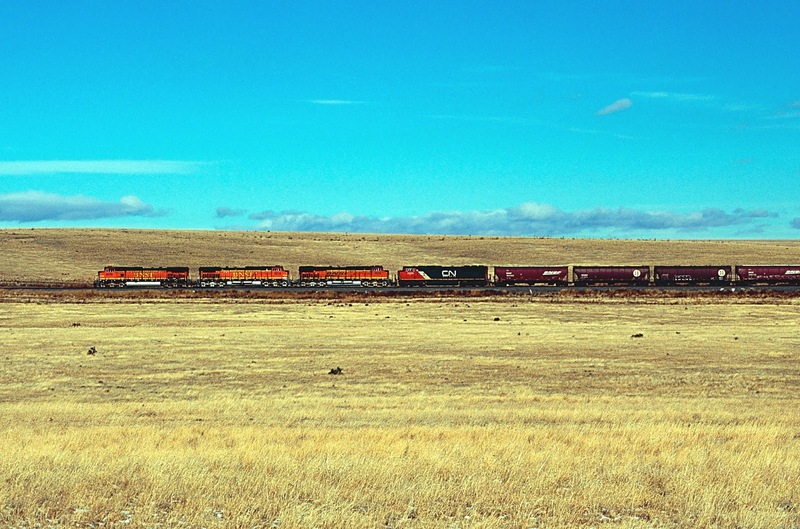 Photograph 12: Late in the day, a lonely BNSF manifest is seen on the high semi-arid plains. At this time of day, when the wind is down, you can hear the trains as far away as you can see them. 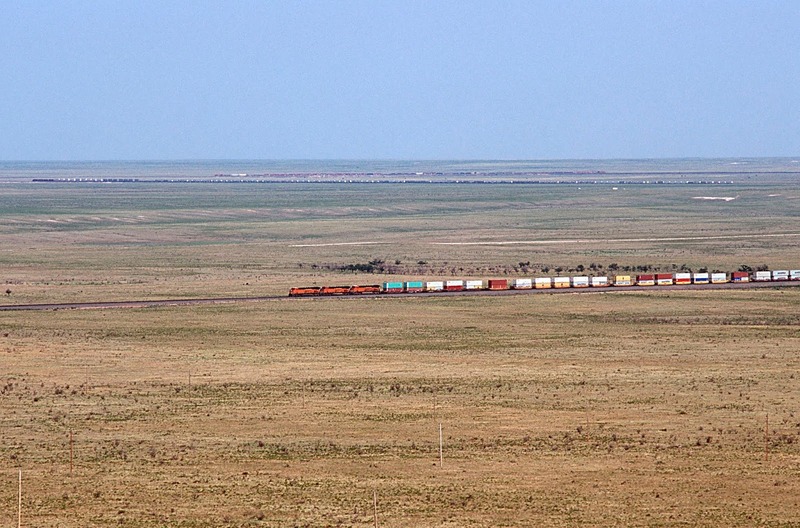 In this case, the tracks are first visible about 12 miles away on the horizon, and the train is the size of a worm. Photograph 13: Three trains are visible in this image. The nearest train is westbound. The train in the middle is eastbound. The far train, a manifest, is also westbound and is running on the newer, more circuitous track that takes a shallower grade up the hill. In this country, the only thing blocking your line of sight is the curvature of the earth. 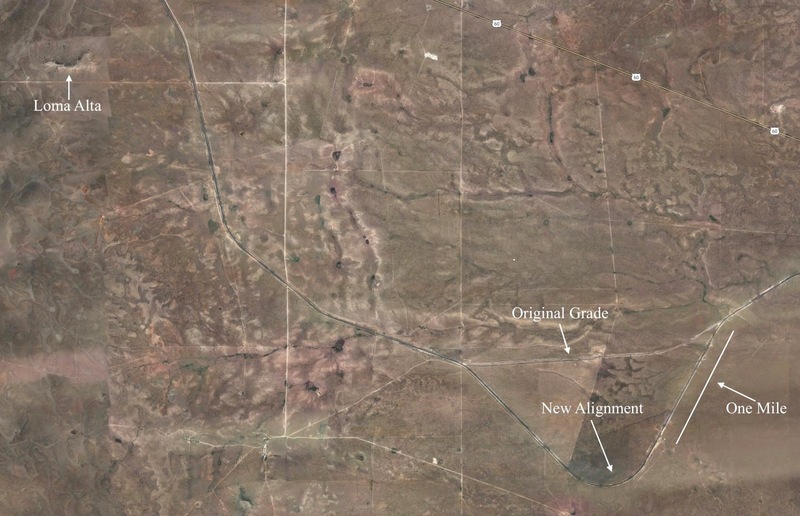 This aerial image shows Loma Alta in relation to the original grade and the new alignment. Also shown are the enormous distances involved in Photograph 13. As you can see, the far train in that image is about six miles from the photographer! 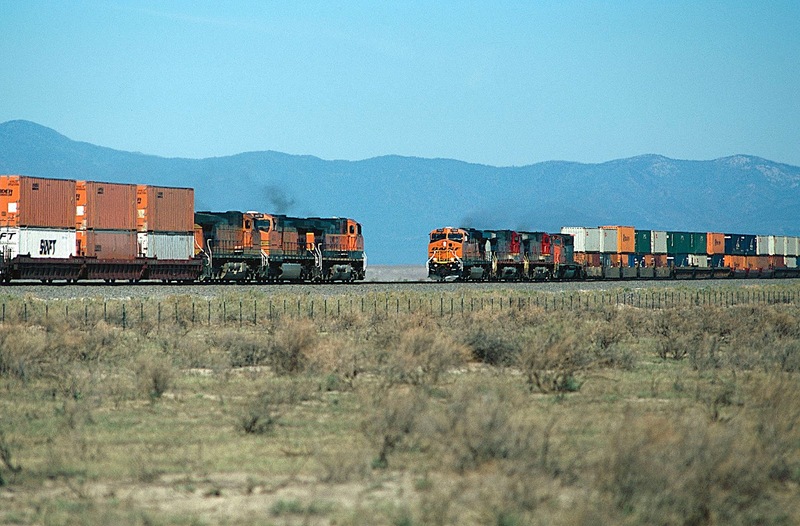 Photograph 14: Pushers on eastbound stacks are racing across the highlands of New Mexico. In the background is Loma Alta, about 12 miles away! 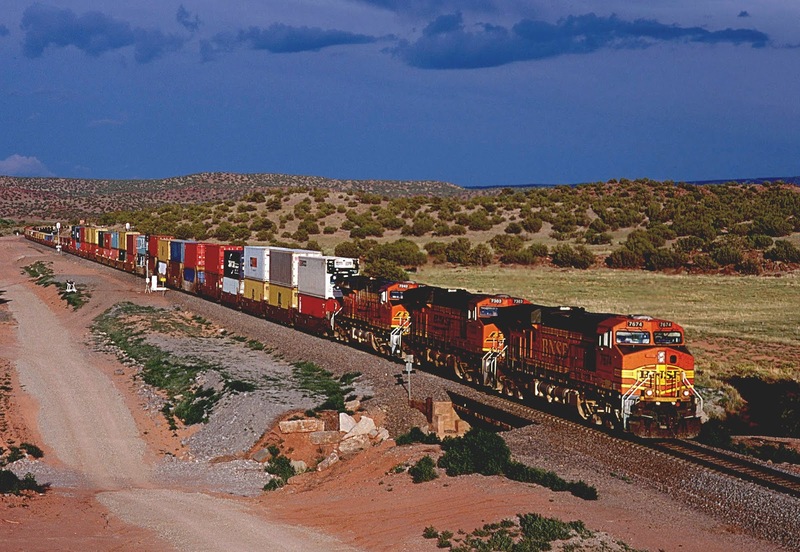 If you are not interested in railroads, then Vaughn, New Mexico, is not much of a place. Today, it looks like a post-apocalyptic ruin, as though a nuclear war might have been fought nearby. At one time, however, before the construction of I-40, Vaughn, the crossroads of three major western highways, sported motels, restaurants and gas stations. Today, with most of the truck traffic on the interstate to the north, there is not much left in town. The motels, restaurants and gas stations are almost all closed, standing silently along the highways, derelict sentinels of a long ago prosperity. The only things in town that give away Vaughn's position as a major railroad destination are the Oak Tree Inn and Penny's Diner, where Union Pacific crews eat and sleep after dismounting and before mounting trains between Kansas City and El Paso. Vaughn is also the location where BNSF's Transcon crosses the UP on a grade separation. Thus, we have a major railroad junction as close to the middle of nowhere as you can get and still be on the face of the globe. I have eaten several meals at Penny's Diner and am fascinated by the picture on the wall of the boys' and girls' basketball teams. Students must come in from miles around. There can't possibly be enough people in Vaughn to supply high school basketball. But maybe I am wrong. Maybe there is more here than meets the eye. In any event, if you like to gaze at night at stars minus light pollution, Vaughn is your place. 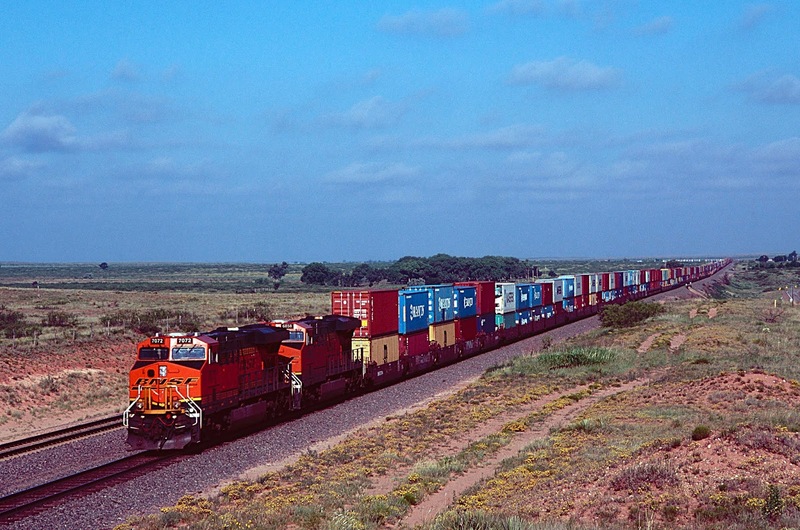 Photograph 15: Pushers on westbound stacks are approaching Vaughn, New Mexico. 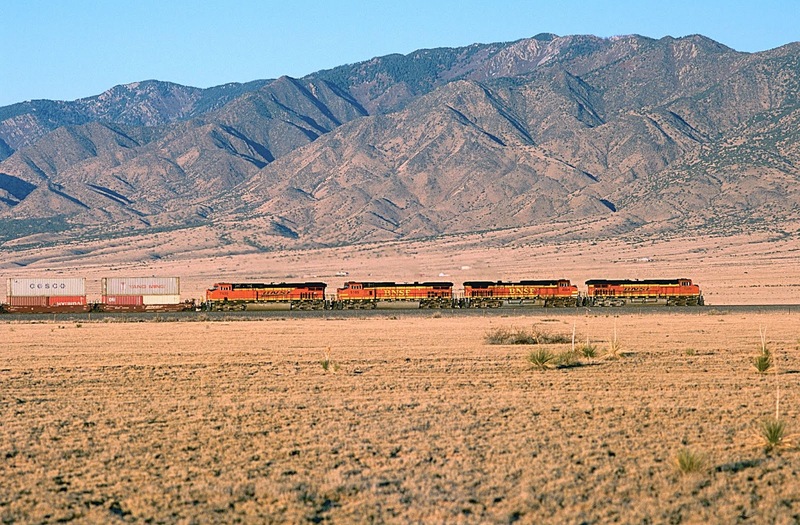 The Union Pacific line to El Paso, Texas, which crosses the Transcon at Vaughn, runs near the base of the mesa in the background. Photograph 16: Closer to Vaughan, trailers race east to Chicago. Photograph 17: The original AT&SF line across what is now the Union Pacific was a single track flyover. 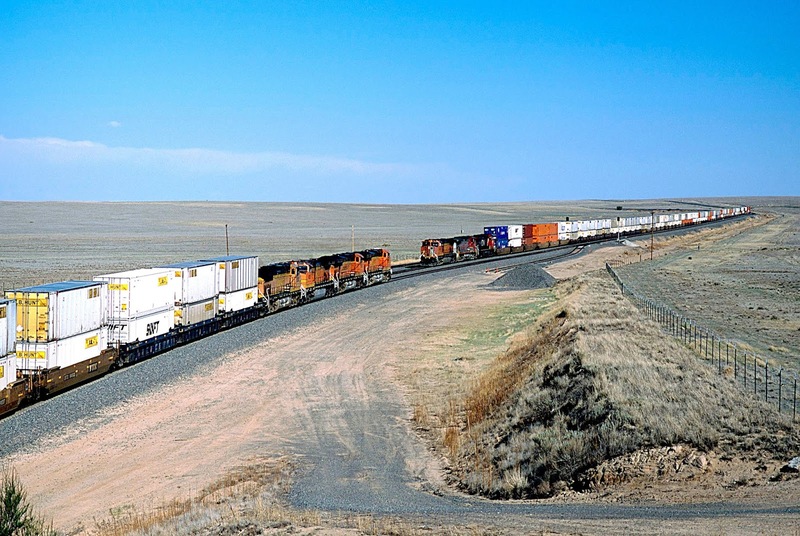 In the summer of 2017, when this image was taken, BNSF was constructing a second, grade-separated track to ease what had become a significant bottleneck on the Transcon. Here, a westbound manifest is passing a road grader leveling the dirt on what will become the second track. Photograph 18: In the winter of 2017, the new second track is completed and is supporting westbound stacks. The original single-track flyover is visible in the background. Photograph 19: UP meets BNSF on the original Vaughn flyover. Photograph 20: An empty eastbound coal train approaches the Vaughn flyover from the west. West of Vaughn, the geography and geology become quite interesting. The Transcon runs on a relatively flat grade until turning downhill and ducking under US Highway 60, dropping about 150 feet in the process. To the north and west are the Pedernal Hills, which have always looked to me like the remnants of ancient volcanoes. The following source, however, indicates that the hills are likely "a remnant of the ancestral 'Rocky Mountains' and are seen today as gently rolling hills of eroded Precambrian rocks." Later in the text, though, the authors propose the hypothesis that portions of the Pedernal Hills "probably represent part of a submarine volcanic field" active long before the formation of the ancestral Rockies. So maybe my intuition is not totally mistaken. In any event, I can find no map of New Mexico volcanoes that includes the Pedernal Hills. As we move west, annual precipitations lessens. In Encino, average rainfall is about 13.5 inches per year, which means this country is just above arid or desert status. (Ten inches or less of rain per year means you are living in a desert.). The one constant I notice about life in this part of the world is dust. When the wind blows, which is most of the time, the air is thick with it and can quickly contaminate camera gear. In this country, I always cover my camera and the top of my tripod with a towel while waiting for a train. 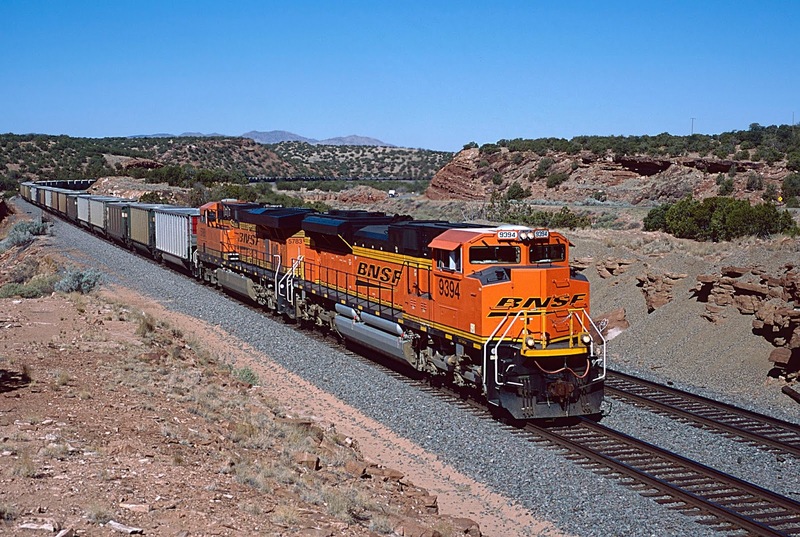 Photograph 21: A westbound grainer has crossed the Vaughn flyover and is headed west toward Encino, New Mexico. Soon the tracks will turn downgrade and drop about 150 feet as they duck under US Highway 60, from which this image was taken. The winter grass has turned bright yellow and the January sun hangs low in the southern sky. Photograph 22: Westbound stacks are gliding downgrade, preparing to pass underneath US Highway 60. Photograph 23: In this image, the photographer is standing at the top of the hill in the image immediately above, looking west toward the Pedernal Hills. A bit of snow remains from an overnight dusting as the train struggles into the grade. 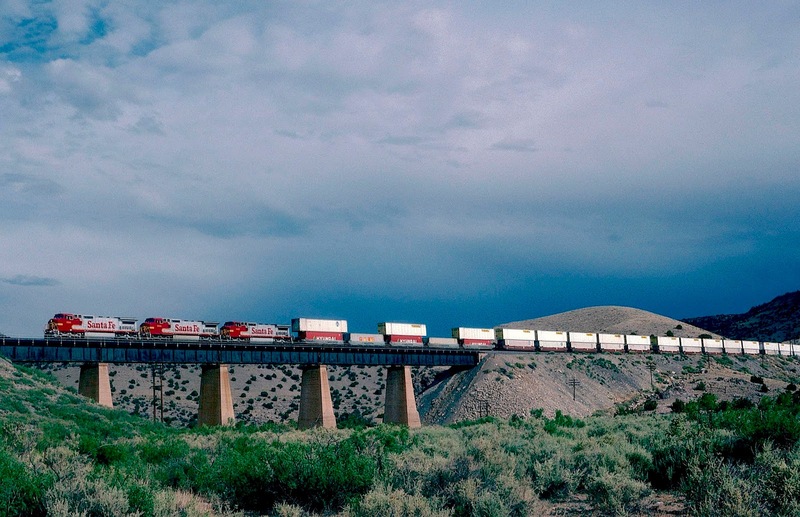 Photograph 24: Two stack trains meet at the US Highway 60 overpass. Photographer is looking east, as in photograph 22. 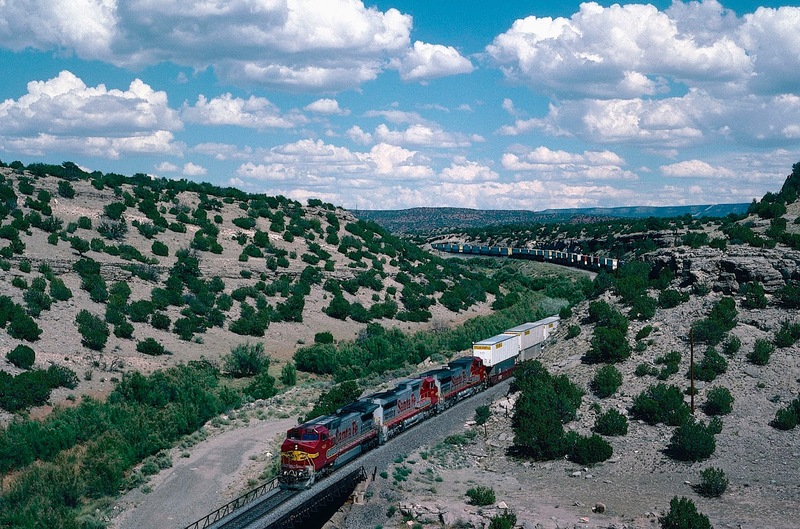 Photograph 25: Trains meeting just east of Encino, New Mexico, with Manzano Mountains in background. 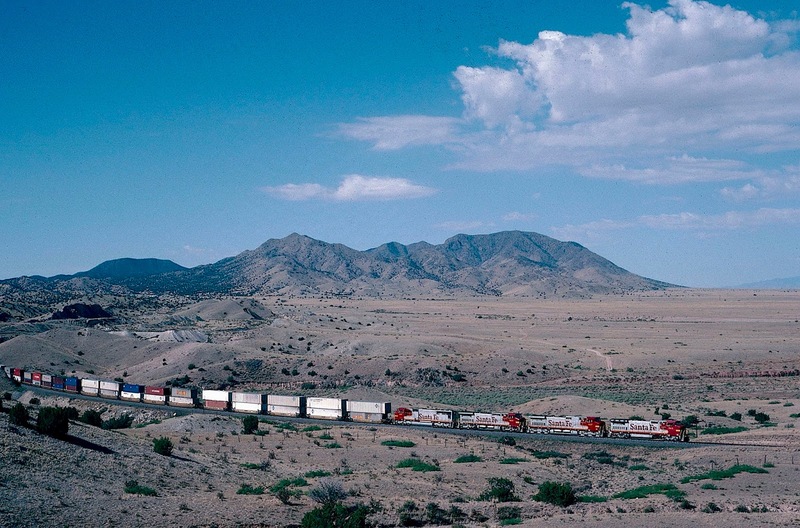 These mountains overlook the valley of the Rio Grande River, and the Transcon passes through them in Abo Canyon. West of Encino, the Transcon turns hard to the southwest and passes the ghost town of Lucy, which once contained a school and two churches. When the climate dried during the Dust Bowl of the 1930's, literally everyone moved away. The only things left today are a few isolated ranch houses. Beautiful golden grass covers the valley now, obscuring for the most part ancient lava. 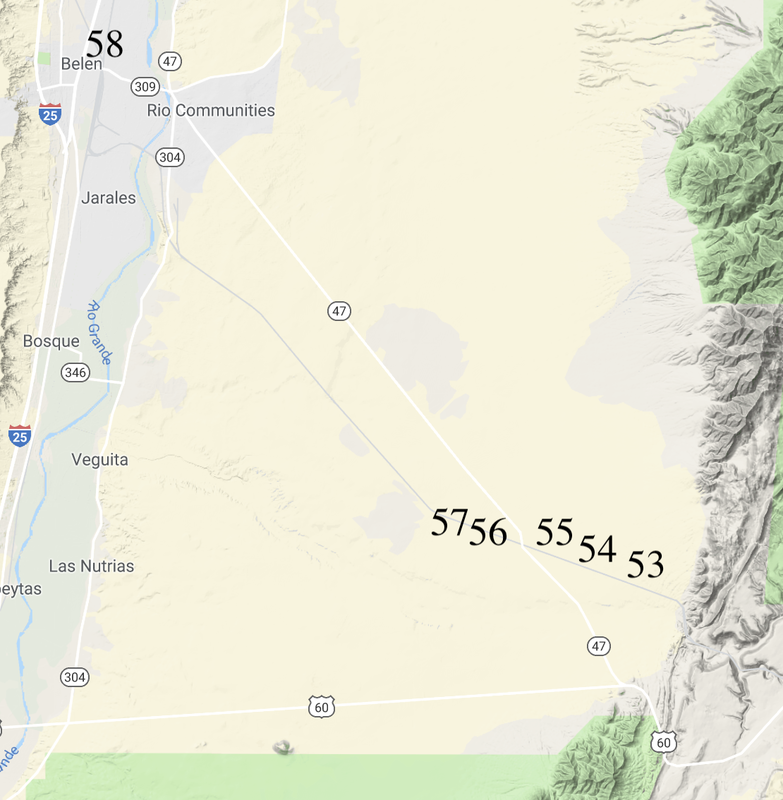 I have searched high and low but can find nothing about this particular location, probably because New Mexico is covered with far more dramatic lava flows, including the one at El Malpais National Monument, which occurred about 3,000 years ago. The lava at Lucy is barely noticeable and barely raises an eyebrow in this country. 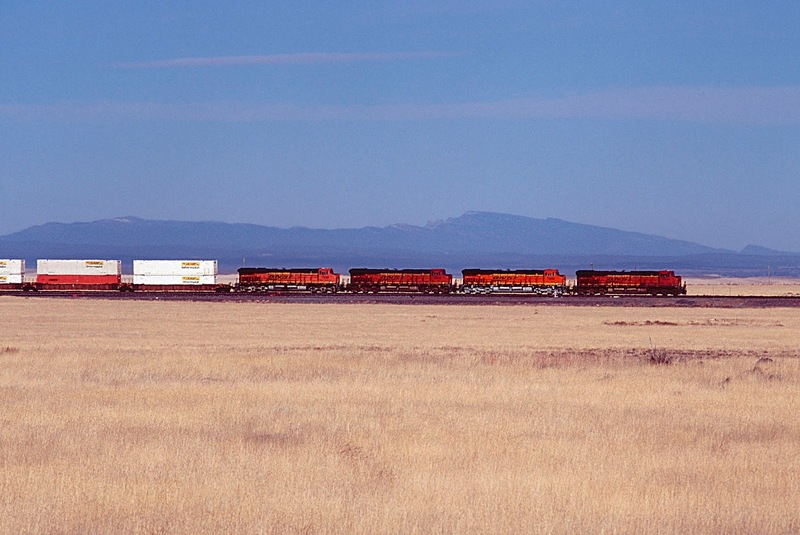 Photograph 26: An empty coal train meets westbound stacks (pulled by NS power) across the ancient lava field at Lucy, New Mexico, with the Pedernal Hills in the background. Photograph 27: Eastbound stacks at Lucy. 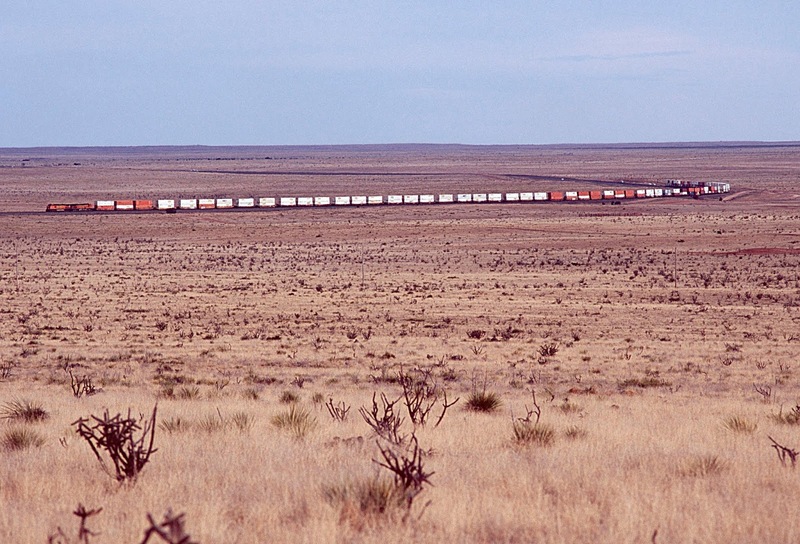 West of Lucy, the Transcon enters the Estancia Basin, which today contains the salt flats and remnants of two lakes that filled and then evaporated over several thousand years. The basin initially formed when the Sandia, Manzano, Manzanita and Los Pinos Mountains were uplifted during formation of the Rio Grande rift about 15-20 million years ago. During the last ice age (between 12,000 and 24,000 years ago) a large lake filled the basin, about 40 miles long and 23 miles wide. Today, it would cover the towns from Estacia to Willard with about 100 feet of water. At the end of the last ice age, the lake dried up. Then as the climate grew wetter, the lake filled again, and this newer reservoir has been dubbed Lake Willard by geologists. Over time, since the newer lake had no drainage to any river, the water became heavily saline. When the second lake also dried up, left behind were a residue of salt, sodium sulfates and magnesium sulfates. The following aerial photograph shows the salt flats, which US Highway 60 and the Transcon cross at Silo. 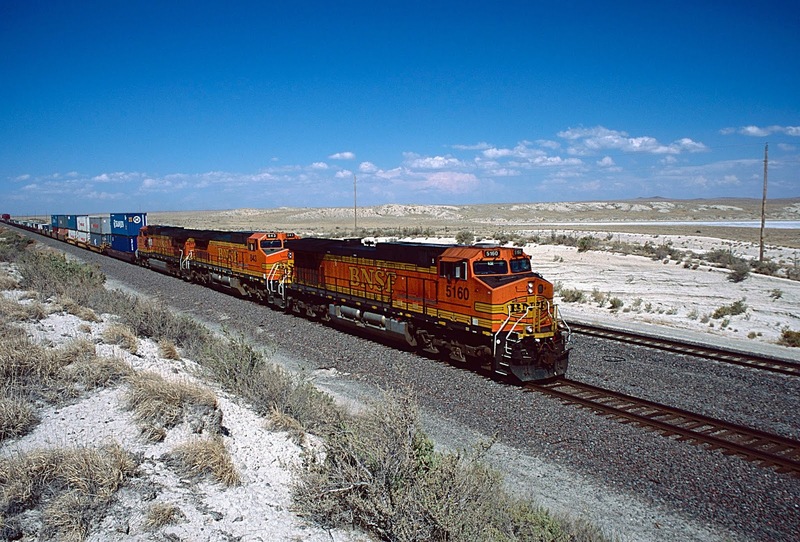 Photograph 28: BNSF 5160 East is climbing through the salt flats east of Willard, New Mexico. 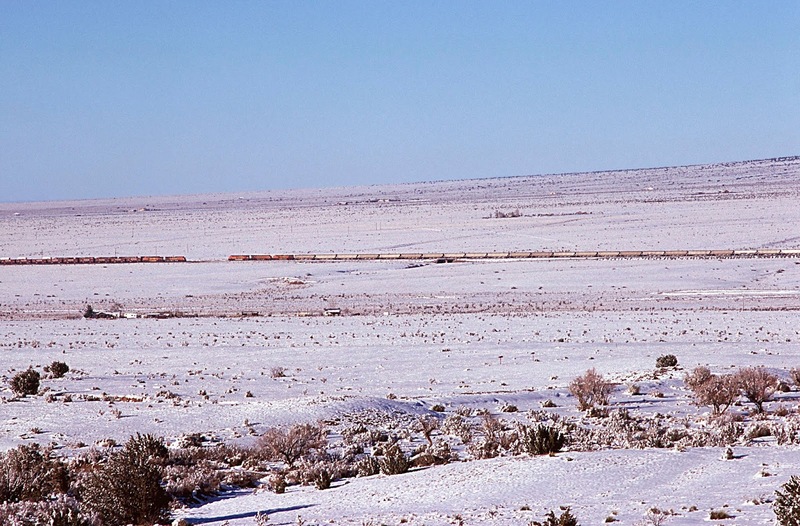 Photograph 29: An eastbound Z-train at Silo after a light snow. 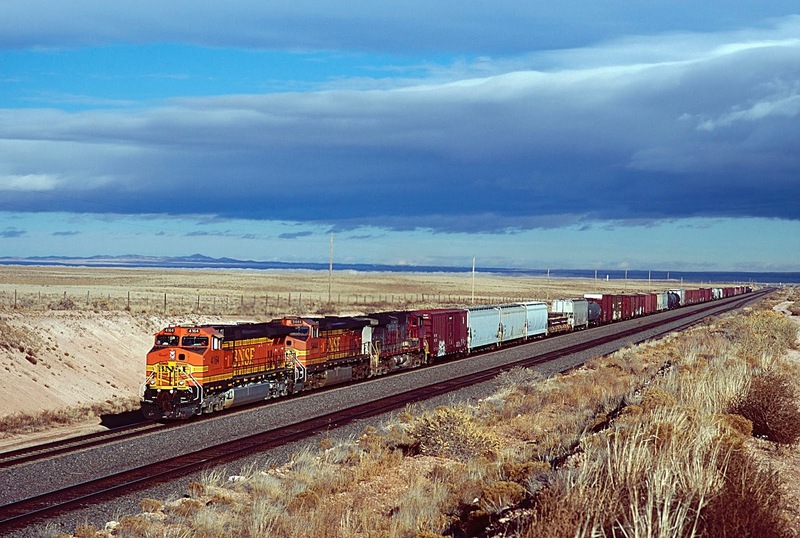 Photograph 30: Westbound stacks have come down off the salt flats and are approaching Willard, New Mexico, from the east. Photograph 31: BNSF 7527 East has just left Willard. The photographer is looking west toward the Manzano Mountains. 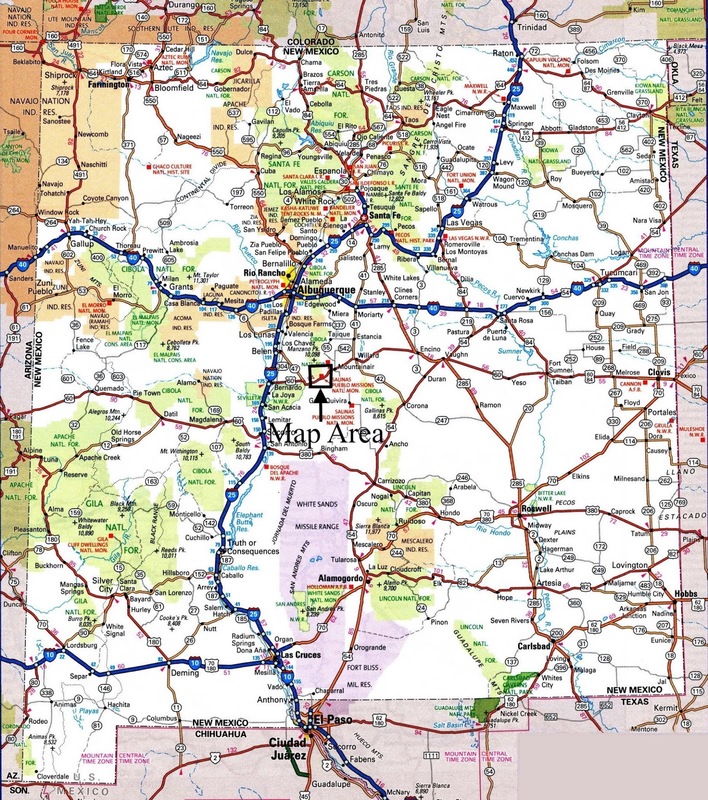 Following is the Wikipedia entry for Willard, New Mexico, as of December 31, 2018: "Willard is a village in Torrance County, New Mexico, United States. The population was 240 at the 2000 census. 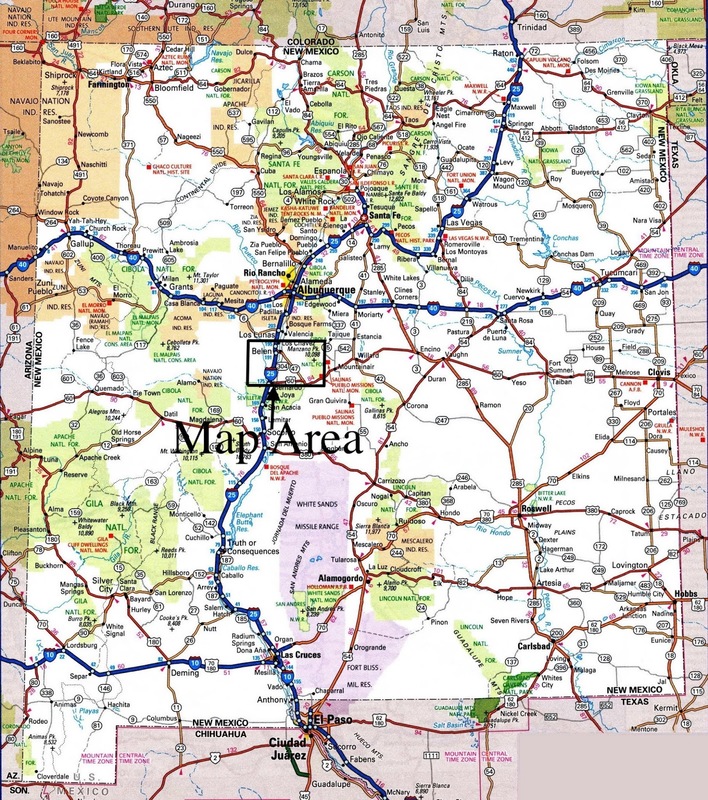 It is part of the Albuquerque Metropolitan Statistical Area. The village is not experiencing the same extreme growth that towns farther north in the state are. A wind farm has recently been constructed upon the mesa just south of the town. It provides power for about 25,000 homes in Arizona." It is not my intent to overly analyze an entry from Wikipedia, but several things from this quote are interesting. 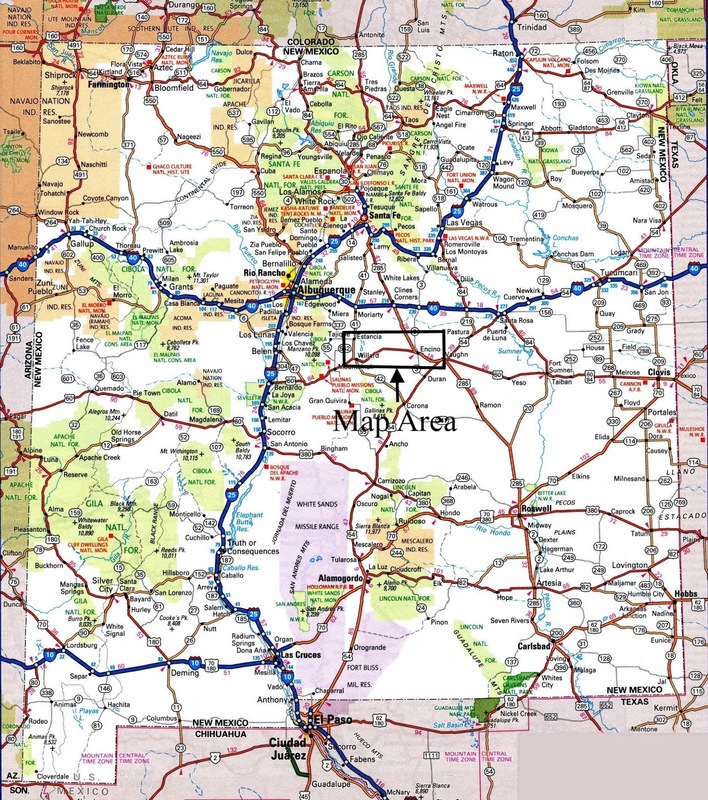 First, including Willard in the Albuquerque MSA is amusing, to me at least, because the two towns are separated by a mountain range, visible in the image immediately above. Second, to say that Willard is not experiencing "extreme growth" is somewhat misleading. Willard is not experiencing any growth at all. A drive through town on US Highway 60 will convince you that what is left of the tiny settlement could blow away at any moment. Finally, although I am not an electrical engineer, I do understand that generating stations, whether coal-fired or wind-driven, feed electricity into the grid and are generally not dedicated to a specific location. So I wonder, perhaps pointlessly, why a wind farm in Willard would send dedicated power to Arizona? Doesn't Albuquerque need the electricity? Photograph 32: This image, taken in the center of town, gives some idea that Willard is not experiencing "explosive growth." Photograph 33: In railroad circles, Willard is probably best known for the huge curve just west of town. 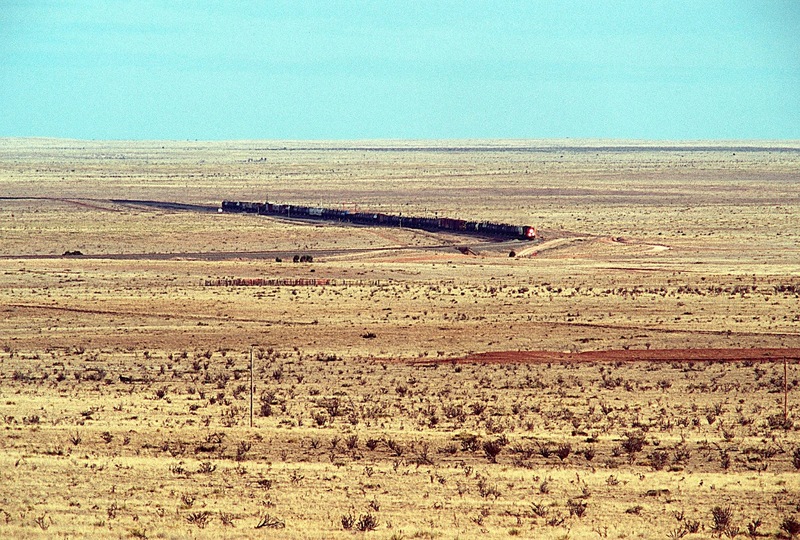 Above, stacks and trailers are negotiating the change of direction on a hot day in July. Photograph 34: A westbound manifest has just come off the big curve at Willard. In the distance stand the Pedernal Hills -- above the motive power. At the village of Mountainair, westbounds turn downgrade and begin the long descent through Abo Pass into the valley of the Rio Grande. 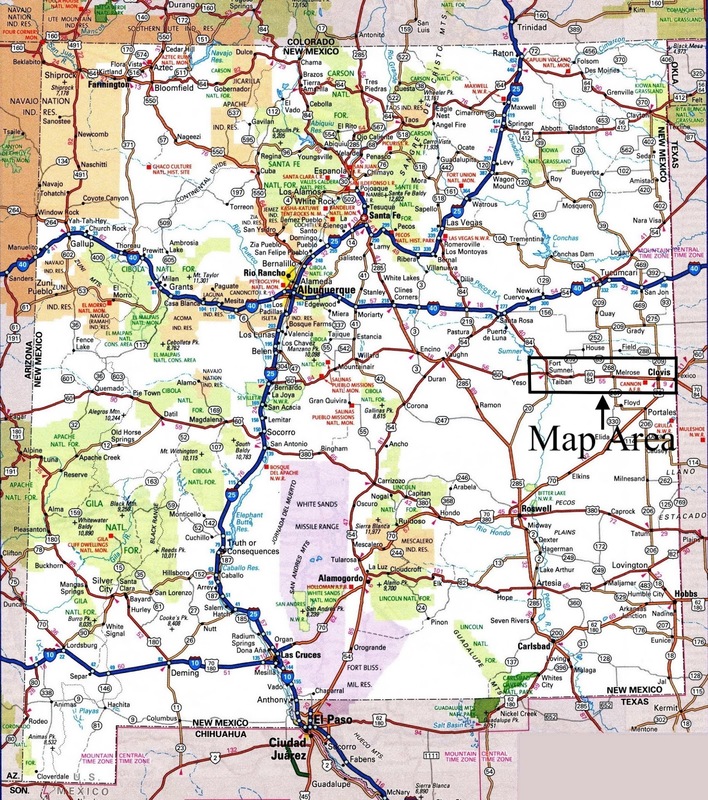 This is the only easy passage from the high country of eastern New Mexico through the central mountains. 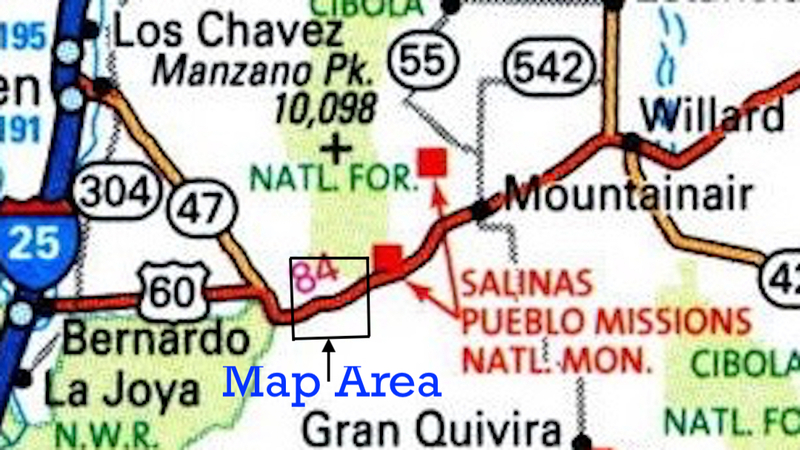 The original AT&SF line to Albuquerque surmounted both Raton and Glorietta Passes, each with grades of three percent that proved operational nightmares, so eventually the Santa Fe constructed the Belen Cut-off to circumvent those grades, passing far south of Albuquerque, crossing the Rio Grande at the hamlet of Belen (Spanish for Bethlehem). 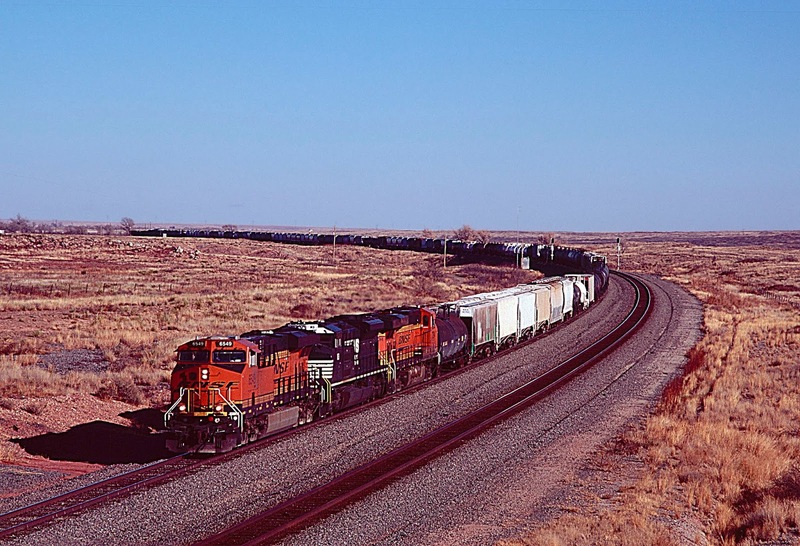 Photograph 35: An eastbound mineral train is climbing the grade to Mountainair. 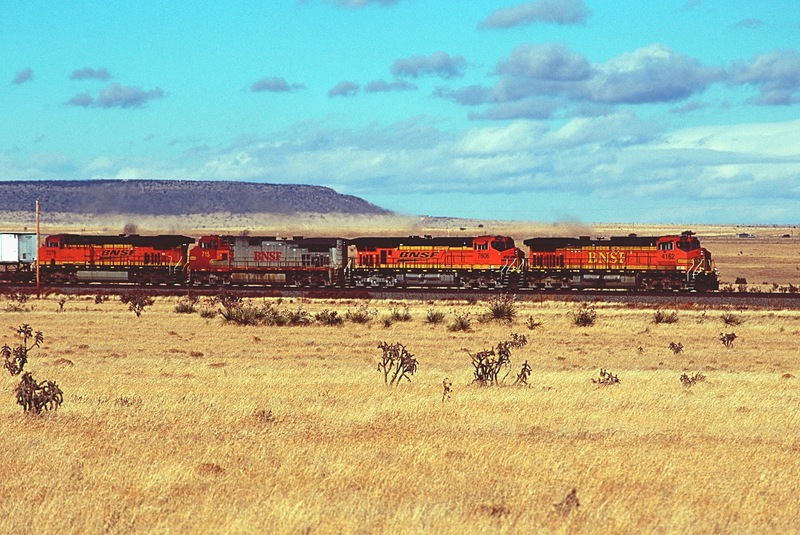 Photograph 36: A loaded coal train passes a manifest at Abo, New Mexico, which was once a small station and settlement on the Belen Cut-off. 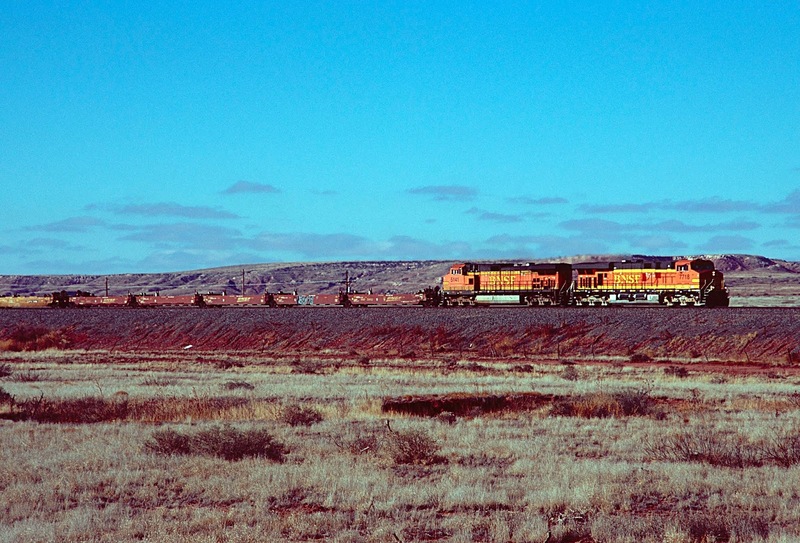 Photograph 37: An eastbound manifest climbs the grade at Abo, New Mexico. Photograph 38: Westbound grain at Chilton's Crossing. Photograph 39: Eastbound empty coal at Chilton's Crossing. Photograph 40: Westbound autos are gliding downgrade through Abo Pass. 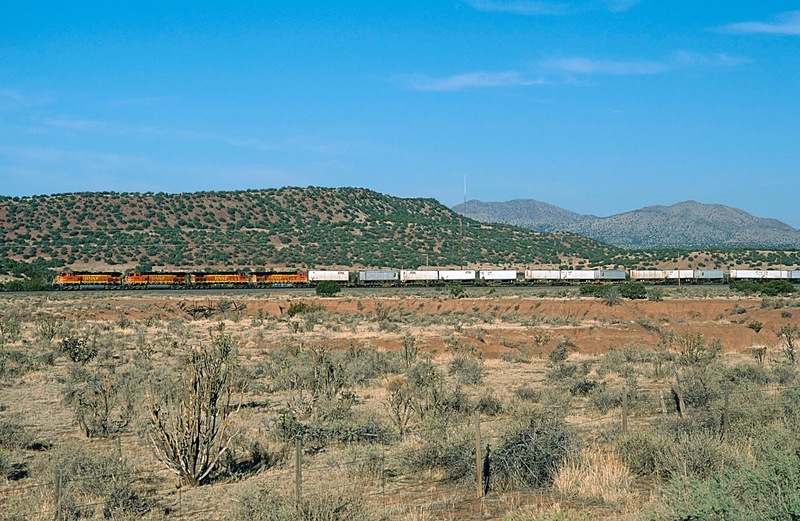 Photograph 41: In one of my favorite locations in the pass, which I've heard called Abo Curve, a westbound stack train is headed toward the narrow confines of Abo Canyon. 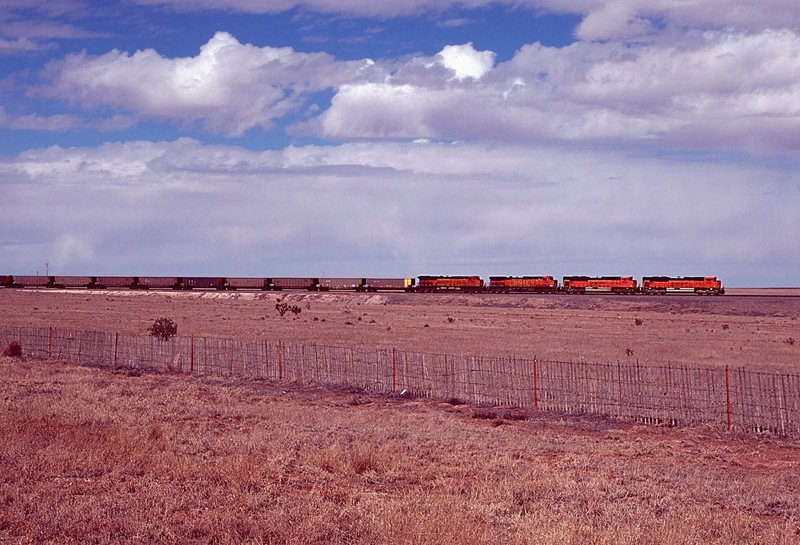 This was before the canyon was widened and double-tracked in the early 21st century. The exposed sandstone, schist and clay show the enormous climatic changes undergone in this region in the past 300 million years. 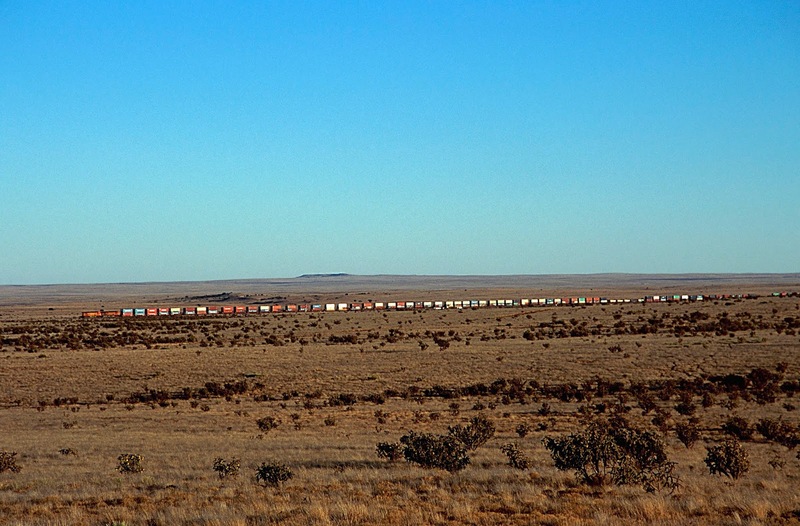 Photograph 42: Eastbound trailers struggle into the grade as they approach Abo Curve. 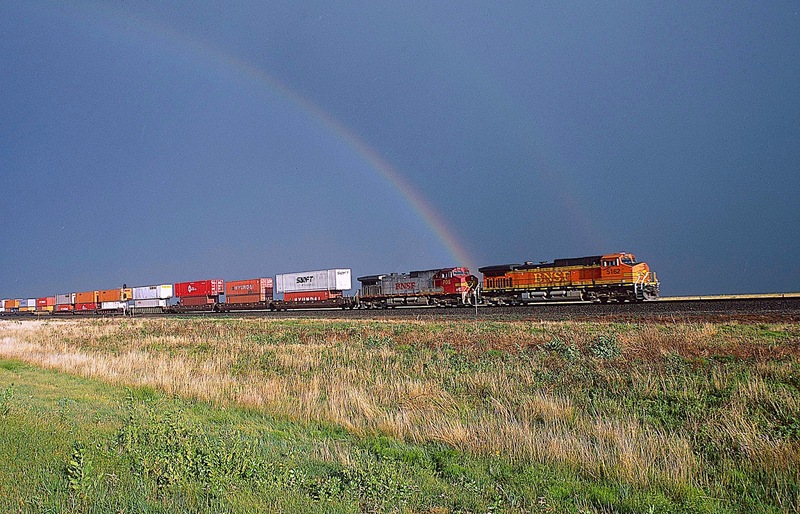 Photograph 43: Westbound stacks have entered the single track at Scholle, with a late afternoon thunderstorm in the background. 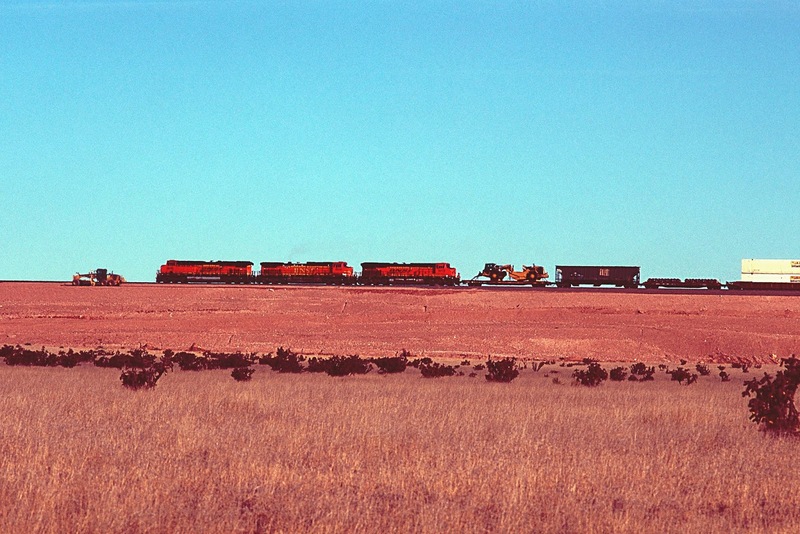 This image was taken before BNSF widened Abo Canyon and installed a second track. 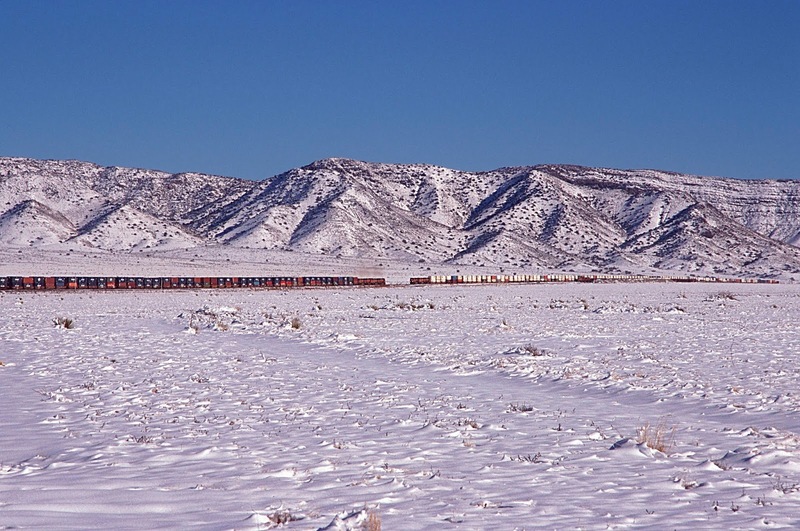 Photograph 44: An eastbound manifest is leaving Abo Canyon after a heavy January snow. The train is on the original narrow track through the sandstone and limestone. 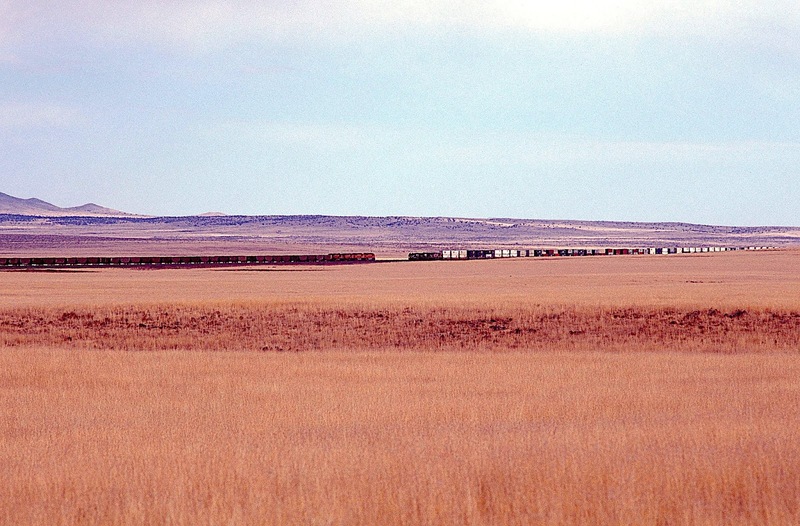 The near track was added by BNSF when the canyon was widened. Almost since the beginning of the AT&SF and Burlington Northern merger, Abo Canyon has been heavily monitored for trespassers. 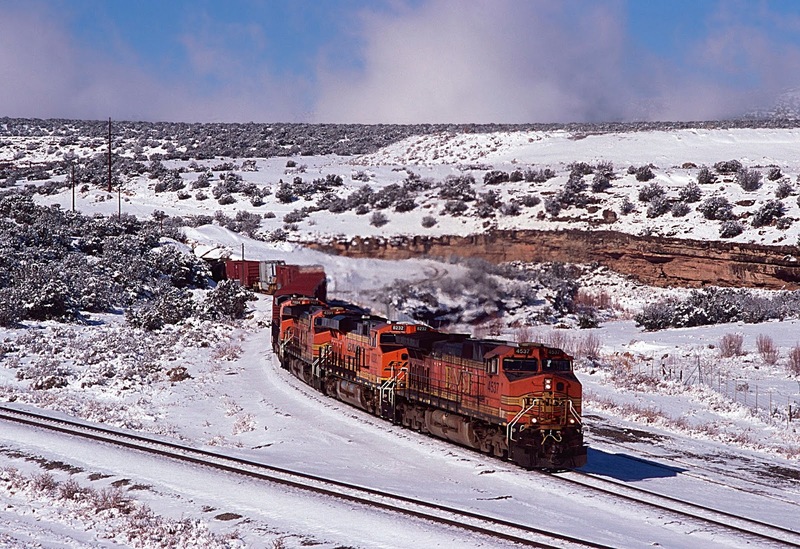 I have thus never obtained an image of BNSF power in the canyon. 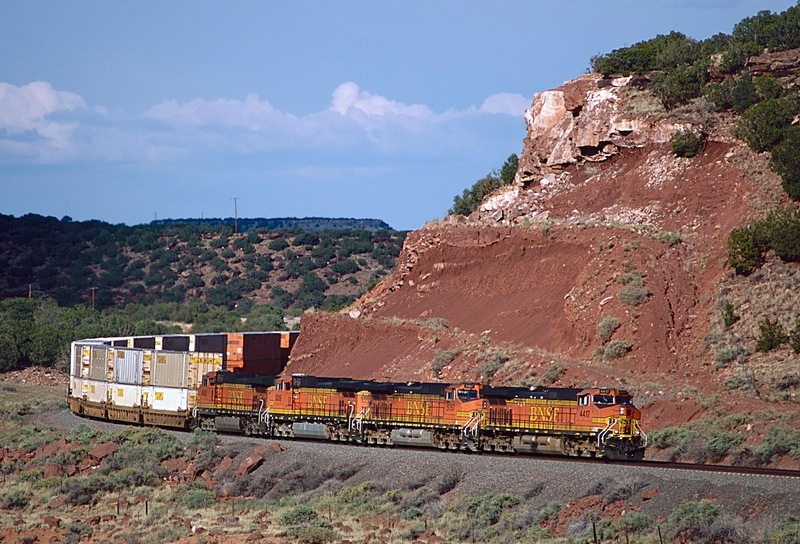 Shortly before the merger, however, in 1995, when Santa Fe was still running shiny new warbonnets, I made a trip west and obtained my last photographs in the canyon, some of which I present here as penance for my failure to obtain BNSF images. The images are arranged from east to west through the canyon. 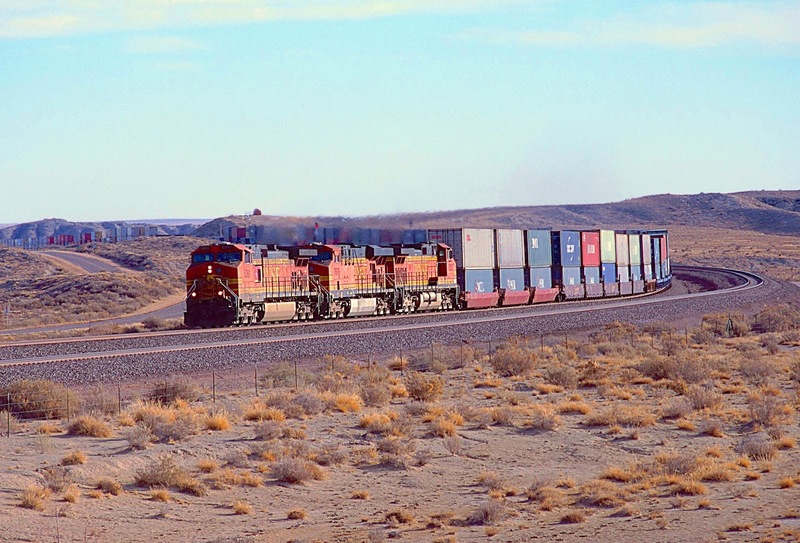 Photograph 45: A westbound merchandise freight is entering Abo Canyon from the east. In the background is the US Highway 60 overpass. The second track through the canyon was constructed to the right of the track in this image and cut a huge swath through the surrounding sandstone and limestone. 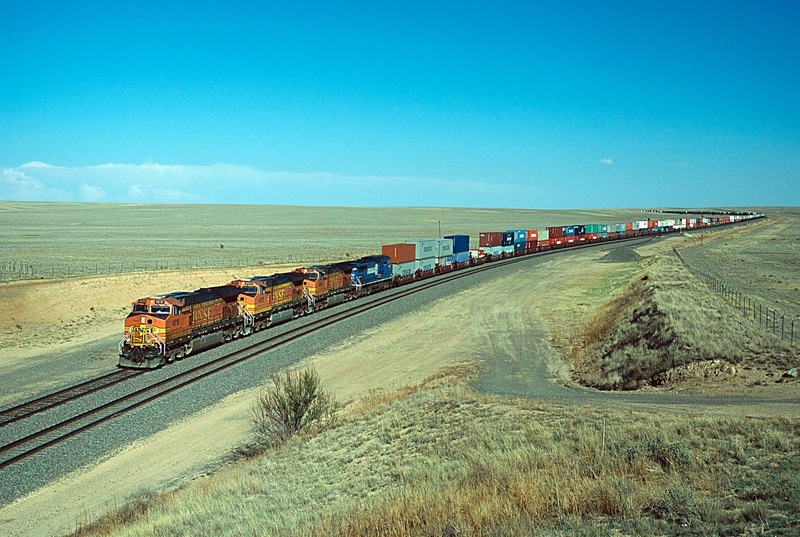 If I were to hike today from the overpass to the location where this image was taken, I would be immediately accosted by BNSF personnel, who would not be friendly. 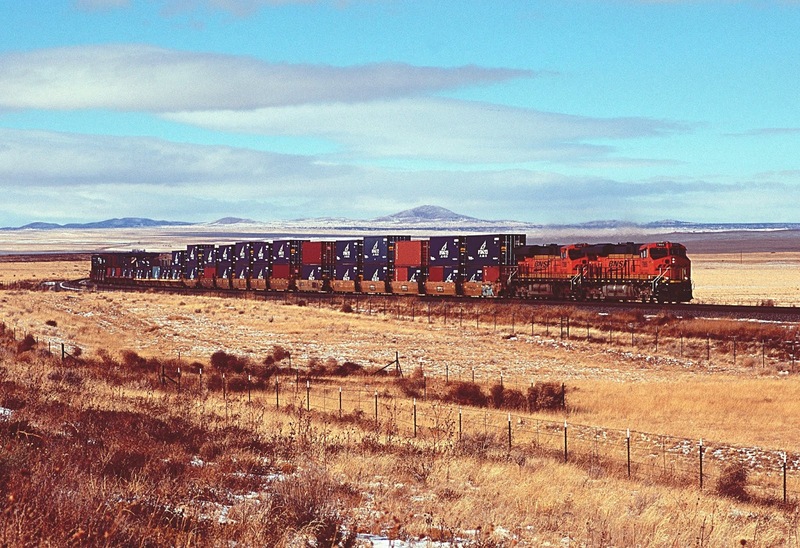 Photograph 46: Eastbound stacks and trailers are preparing to exit the canyon near the location where the previous image was taken. 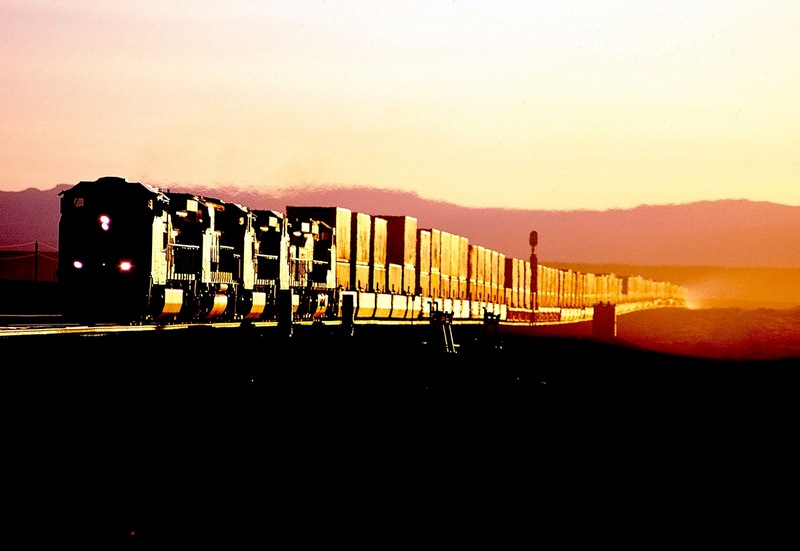 Photograph 47: A westbound intermodal is photographed from the same location as immediately above, only looking in the opposite direction. Photograph 48: Eastbound trailers are emerging from the cut visible in the rear of Photograph 46. Photograph 49: The camera is looking into the cut at the rear of Photograph 48. 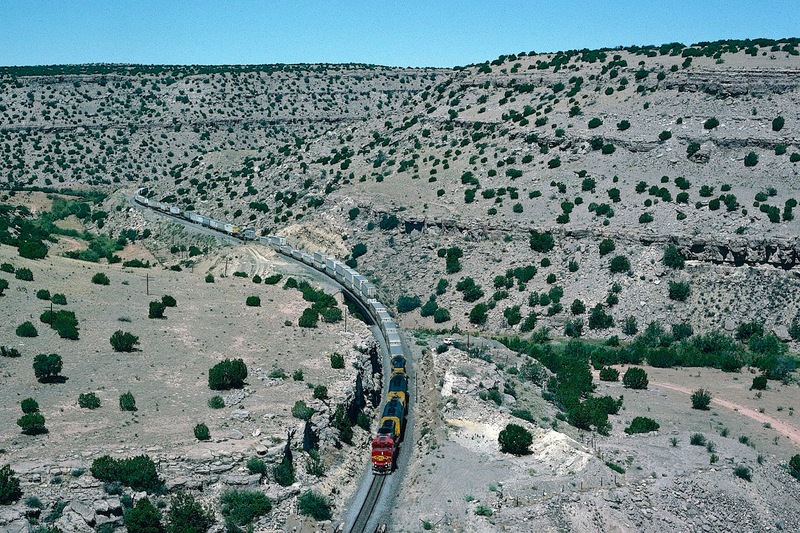 When this image was taken (1995), the Santa Fe freely allowed railfans into the canyon for photography. All you had to do was show up at the Belen office and sign a release. Then you could drive all over the place. If you look closely in this photograph, you will see a white vehicle parked to the right of the last unit. The photographers were two young men in Bermuda shorts who spent the entire day racing back and forth through the canyon like disturbed gerbils. I stayed above in the hills and enjoyed the show. 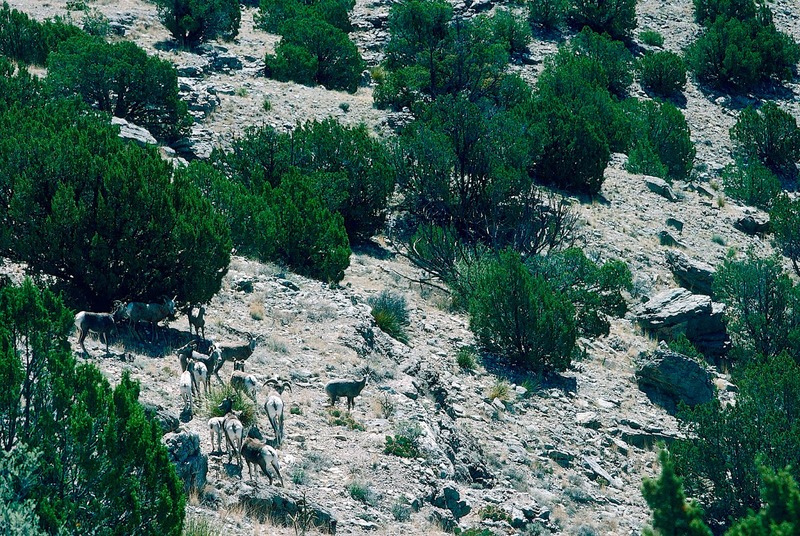 Photograph 50: One day in the canyon, I stumbled across a group of what I believe were bighorn sheep. My identification my be wrong, because I am not a zoologist, but this image shows a portion of the herd, which was led by the male in the center of the picture with his back turned. I think they smelled me before they saw me, but eventually they recognized danger and began moving lower in the canyon. When they neared the Santa Fe tracks, the male climbed up and looked in both directions, checking for trains. They he went back and led the females, other males and adolescents across, one-by-one, until everyone was safe. Then he crossed, and they disappeared into the mountain cedars. No one believes this, but it is absolutely true. 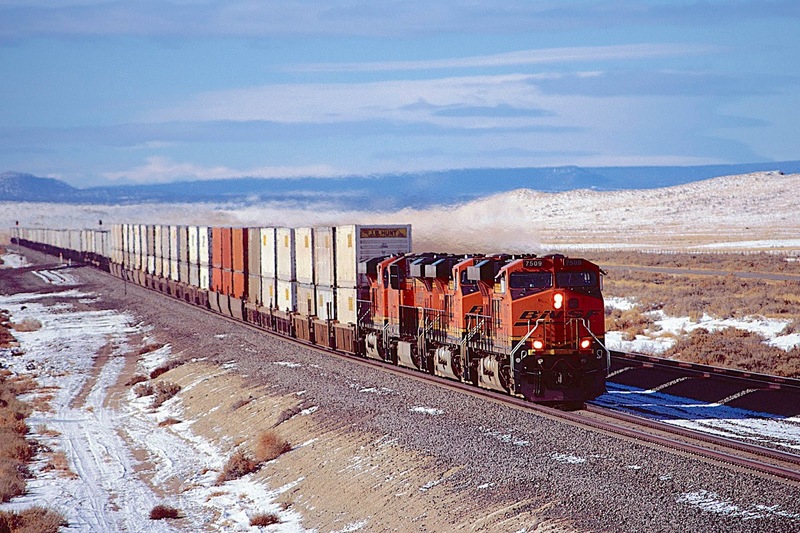 Photograph 51: Westbound stacks cross the last bridge on the west side of the canyon. 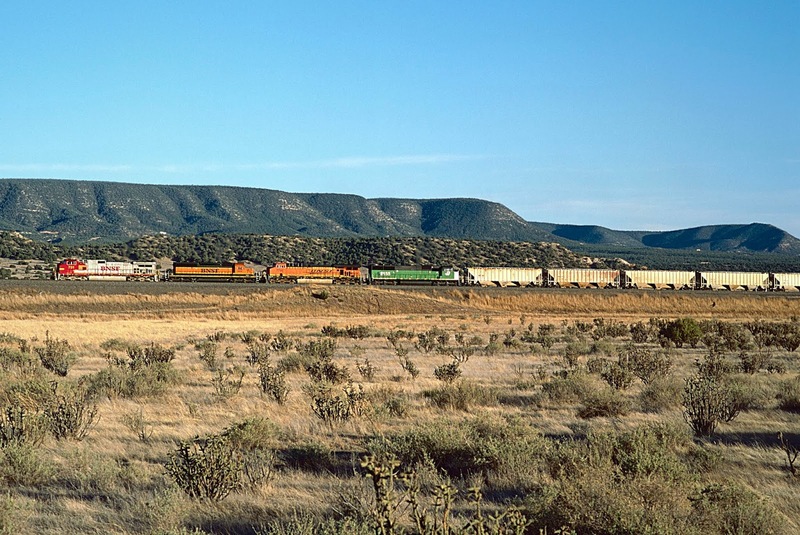 Photograph 52: Westbound stacks are exiting Abo Canyon at Sais, with the Los Pinos Mountains in the background. 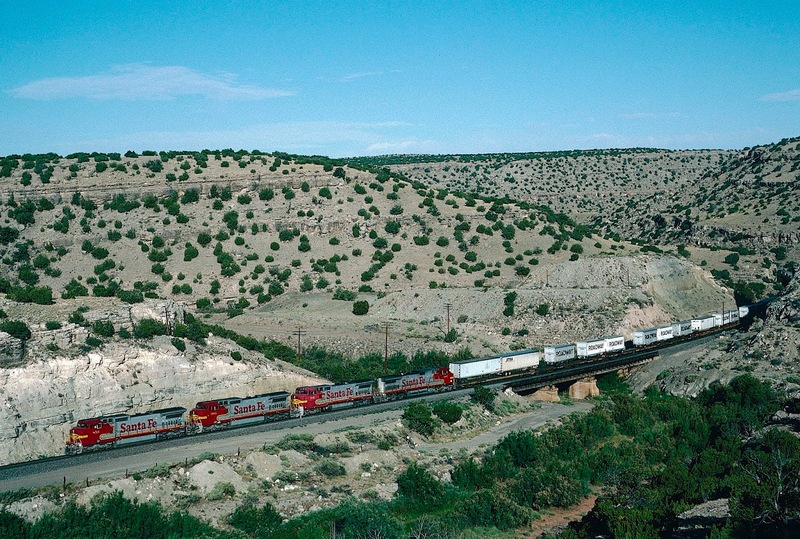 After the Transcon exits Abo Canyon on the west, the tracks run downgrade across the remarkably wide valley of the Rio Grande River. 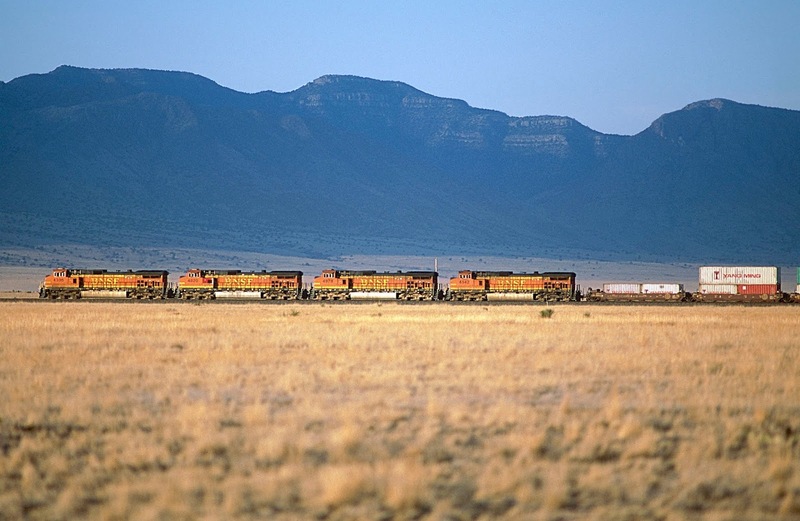 The land slopes steeply from the waters' edge to the base of the Mazano Mountains, and trains crossing this arid country look like black threads on white cloth. 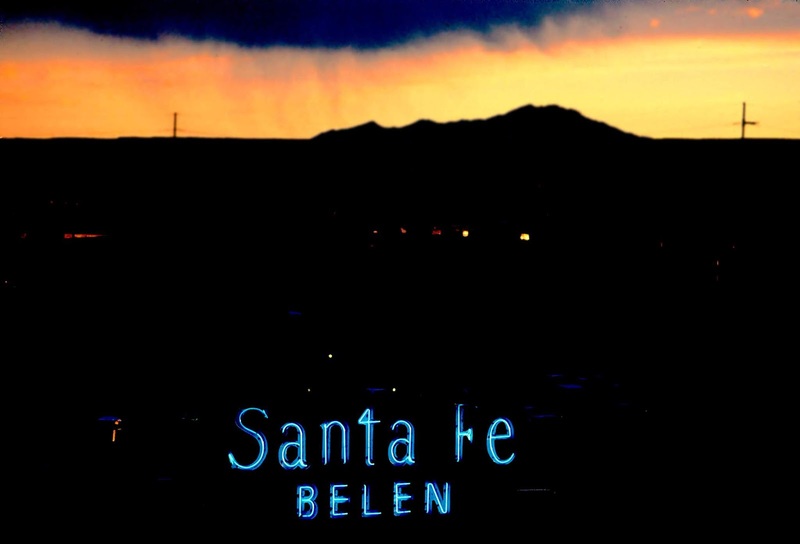 At the bottom of the valley sits Belen, New Mexico, a division point and major yard. 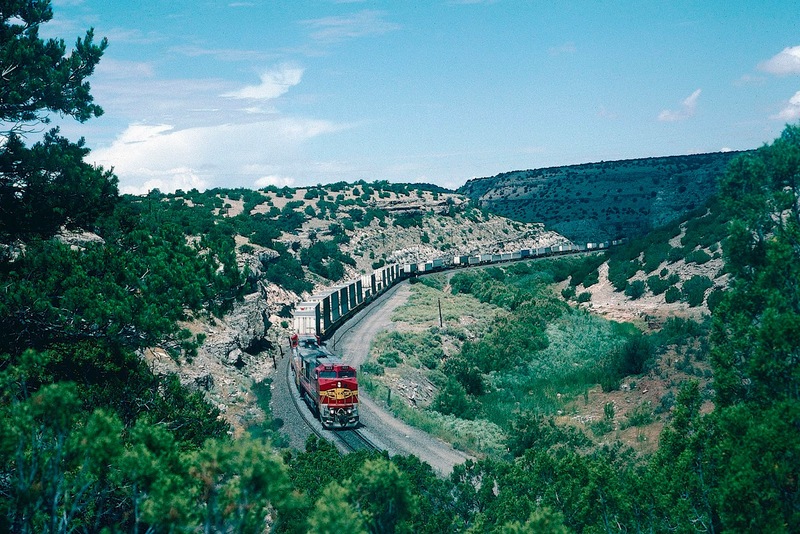 Photograph 53: A westbound coming out of Abo Canyon meets an eastbound climbing the grade out of the valley of the Rio Grande River, with the Manzano Mountains watching silently in the background. 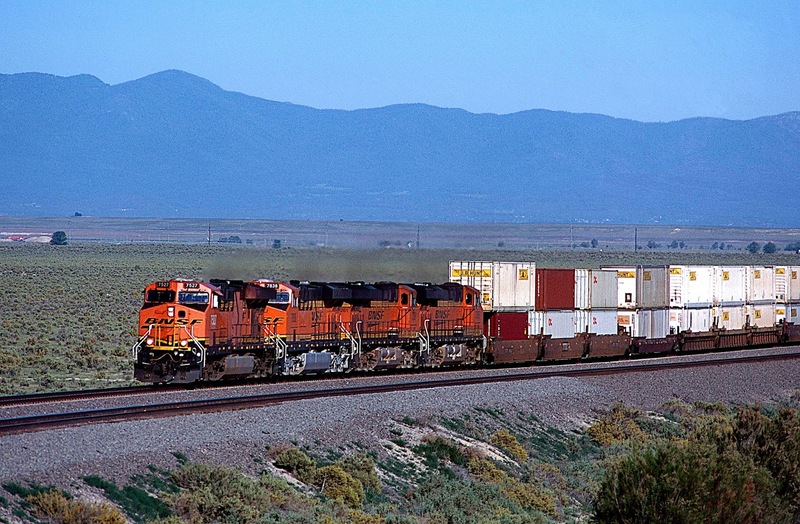 Photograph 54: Two BNSF freights meet on the upslope of the Rio Grande Valley. The horizon accurately shows how the land tilts upward toward the Manzano Mountains, giving some idea of the tectonic forces at work. 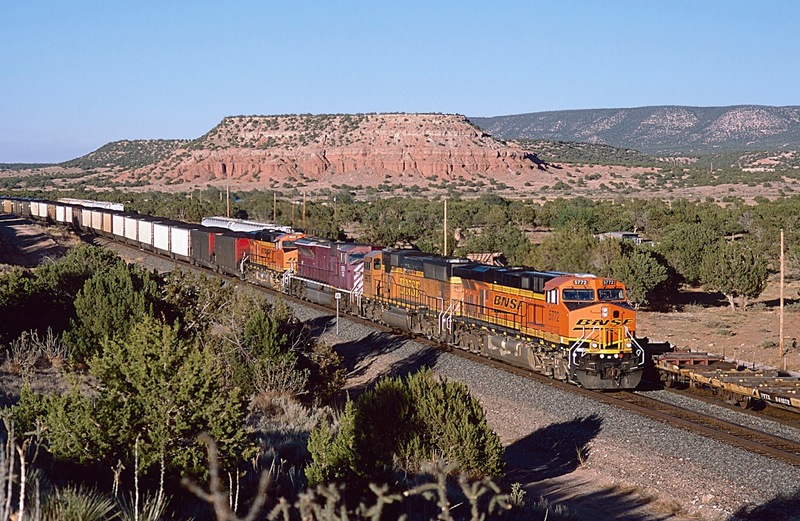 Photograph 55: Eastbound stacks are climbing toward Abo Canyon beneath the Monzano Mountains. This image was taken in December, when the sun is low in the southern sky. 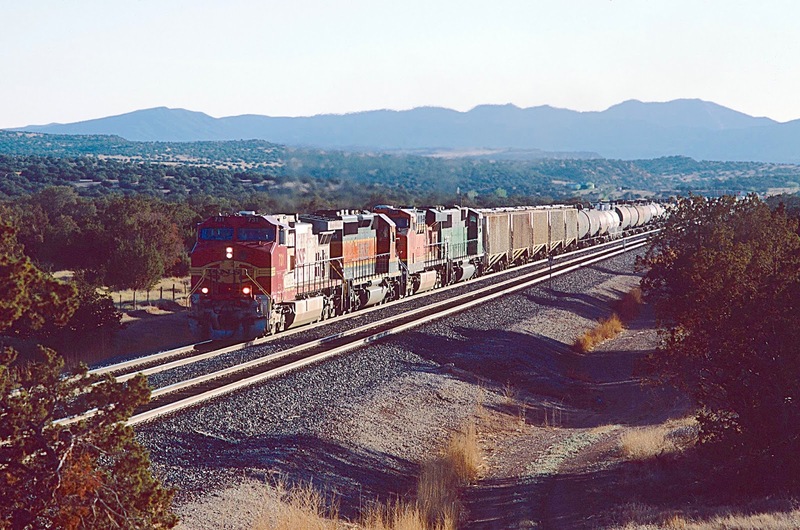 Photograph 56: Eastbound stacks are climbing toward Abo Canyon beneath the Los Pinos Mountains. This image was taken in mid-June, when the June sun rises north of due east. 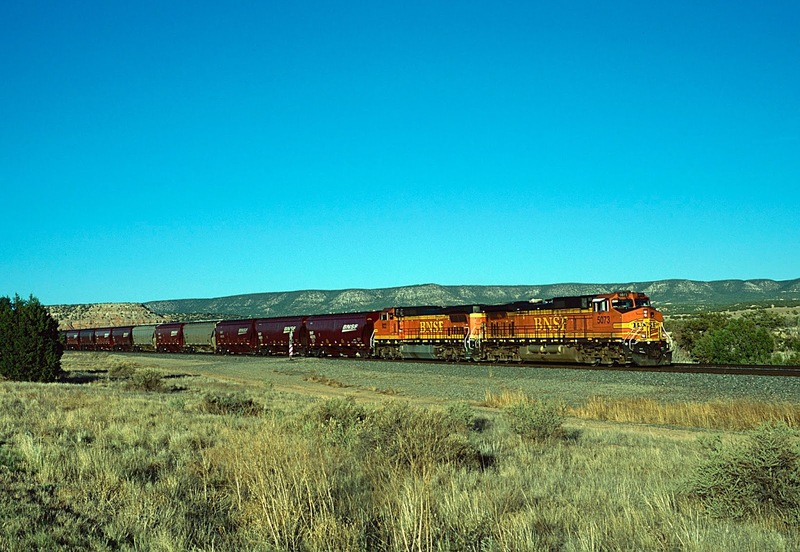 Photograph 57: Eastbound stacks are climbing the grade out of Belen, New Mexico, toward Abo Canyon at sunset. Photograph 58: Belen, New Mexico in 1995. Thus ends Part Two of the journey across the BNSF Transcon from Kansas City to Cajon Pass.